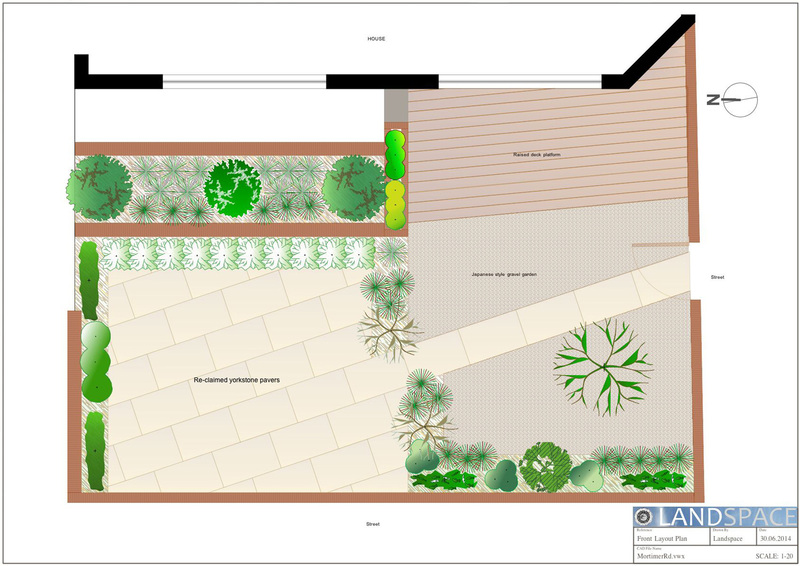 Landscape design for small gardens, by professional landscapers Landspace. 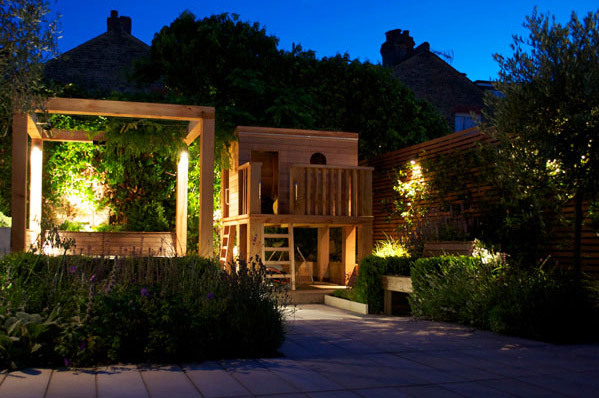 Landspace Design were commissioned to transform a small, overgrown and neglected urban back garden in Kew into a low maintenance, private contemporary space which could be used to entertain friends and family both during the daytime and at night. 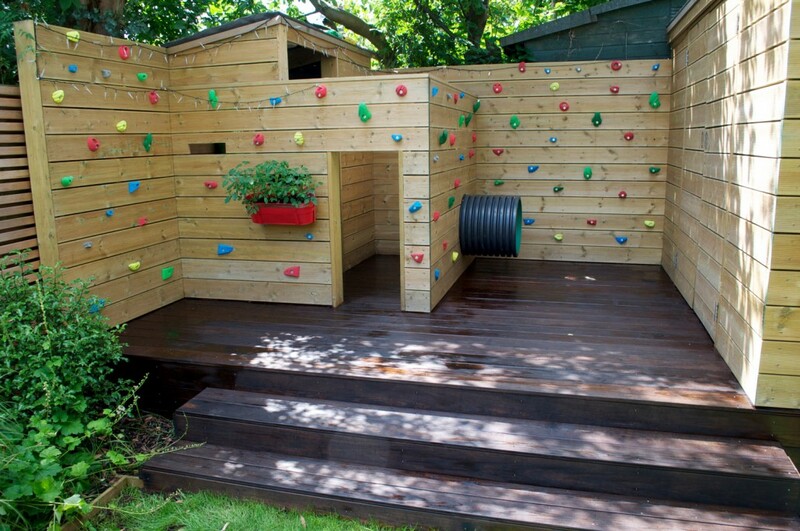 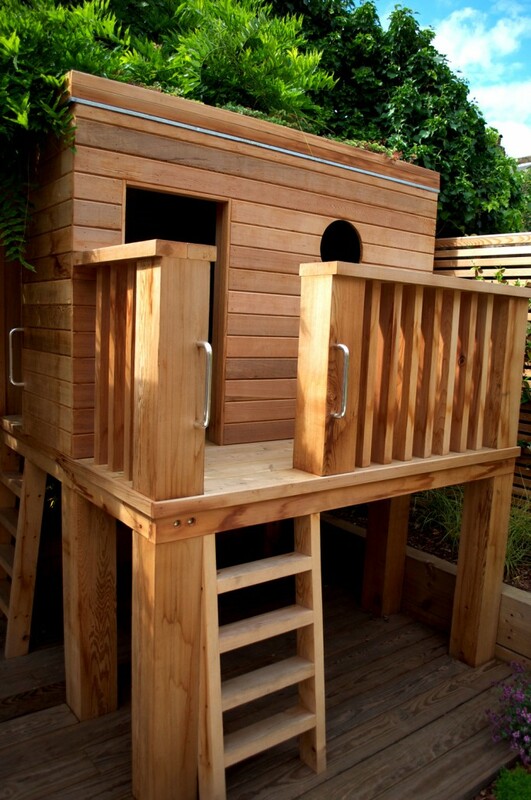 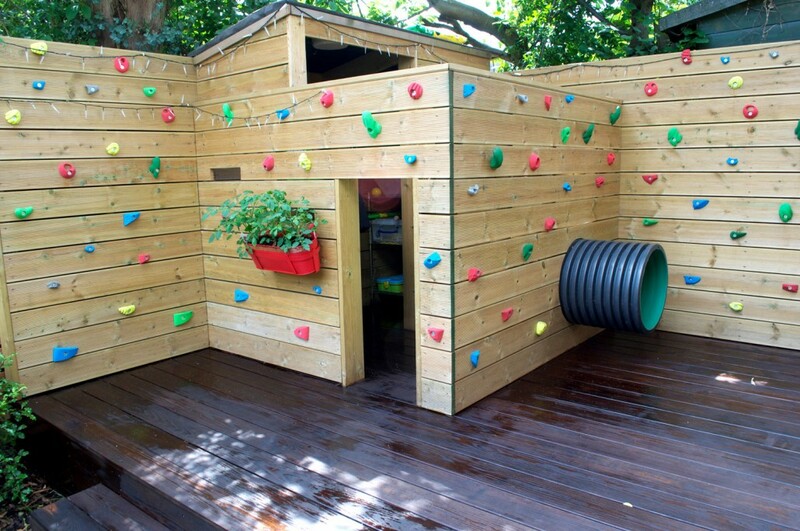 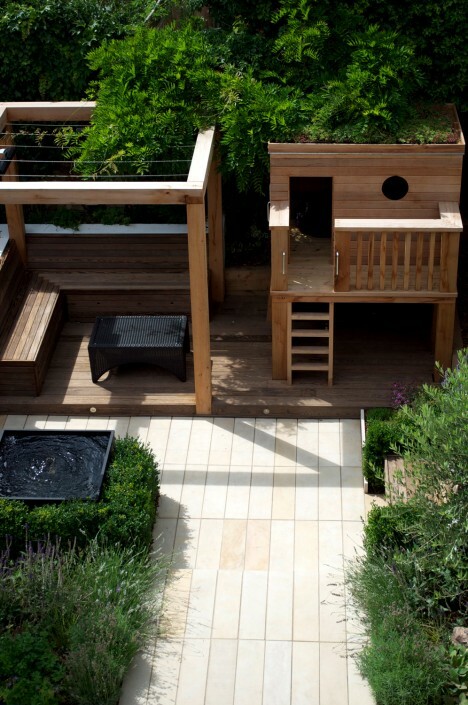 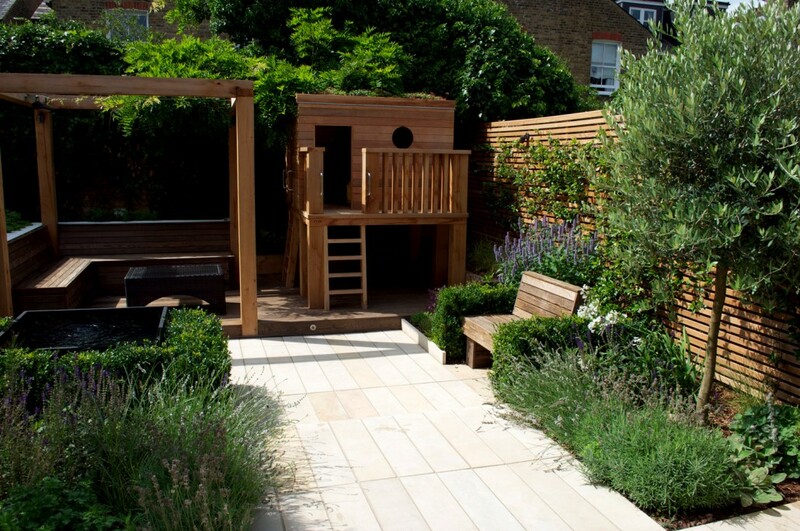 It was essential for the finished garden to be a fun place for children too and water, lighting, storage, outdoor heating and a herb area were also essential to the brief. 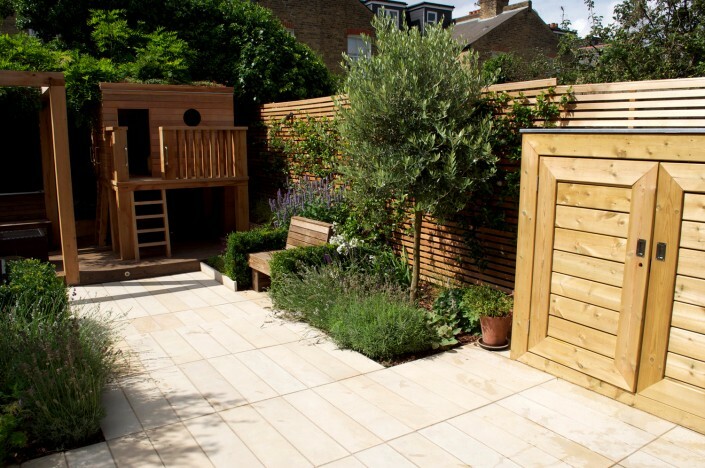 To learn more about how we transformed this small back garden into an award-winning outdoor space, to the absolute delight of the client, click here. The small front garden of this Victorian property was looking rather neglected, untidy and disorganised so professional landscape designers Landspace Design were commissioned to reinvigorate the space with a simple, welcoming and traditional-looking garden solution which complemented the Victorian property and was also functional in terms of provision of bespoke, concealed storage for refuse and recycling. To learn more about how Landspace Design transformed this urban front garden into a unique, award-winning space, click here. 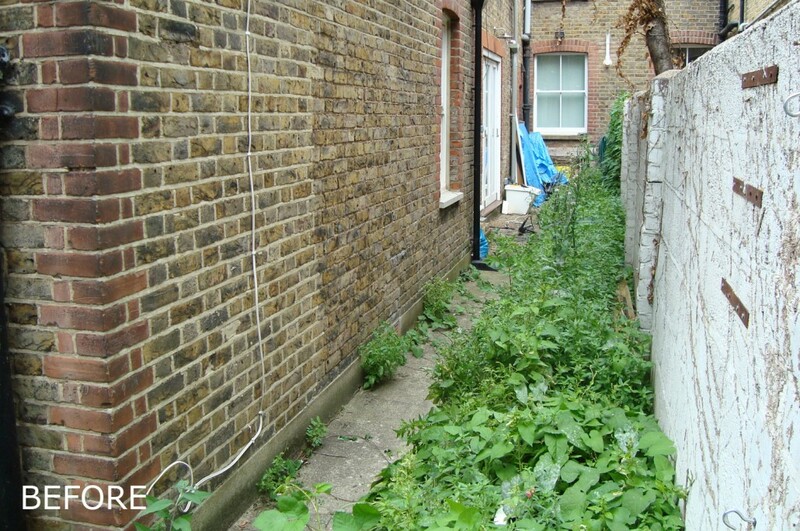 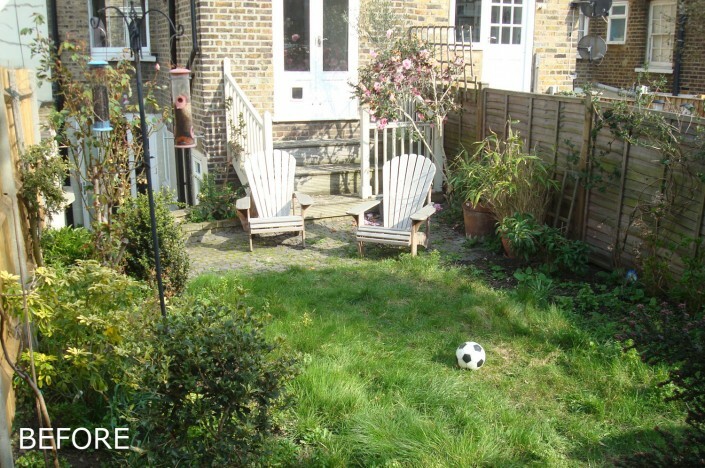 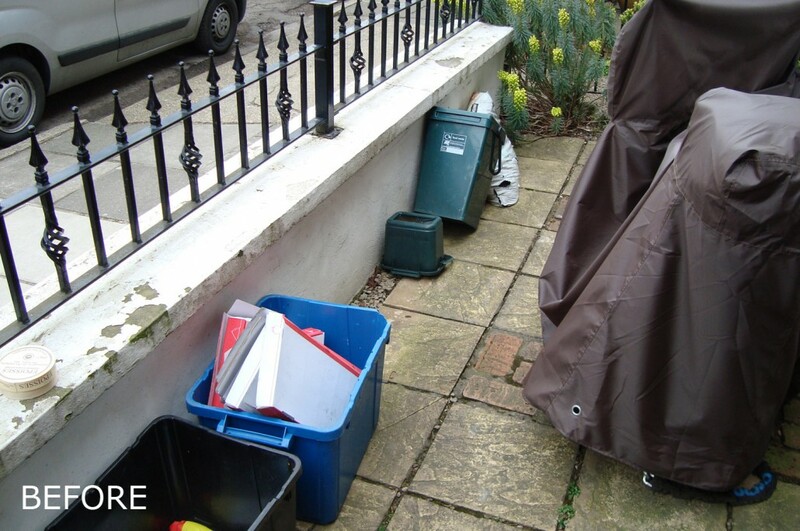 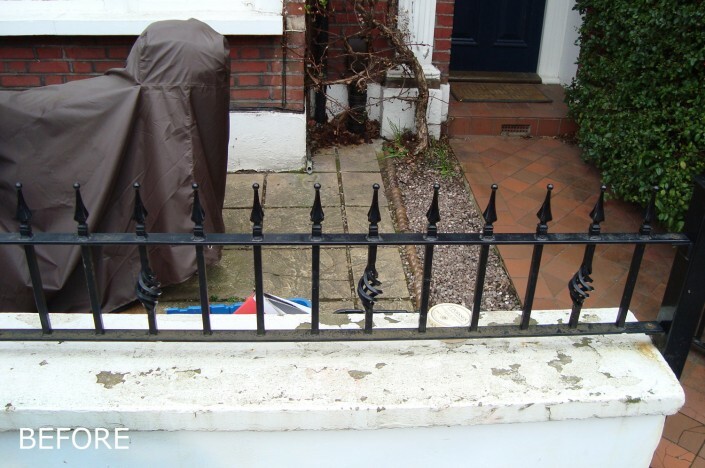 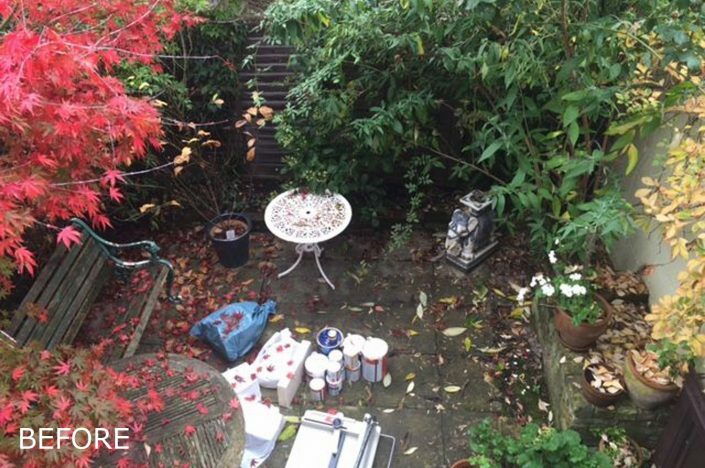 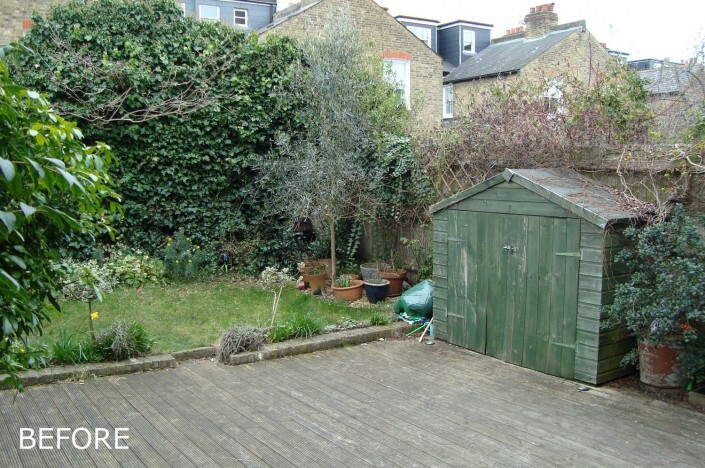 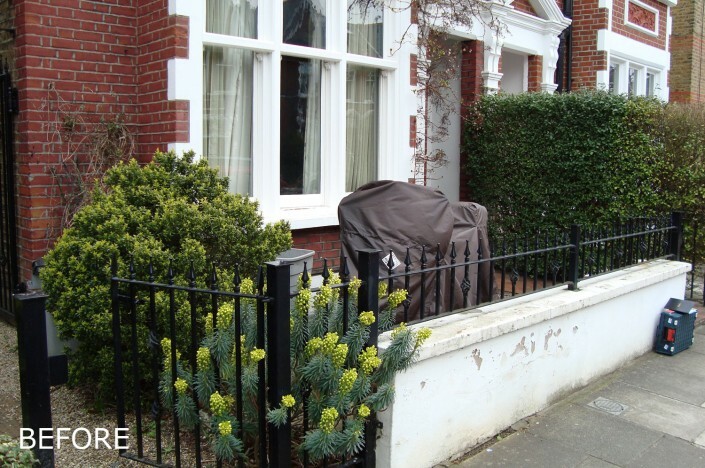 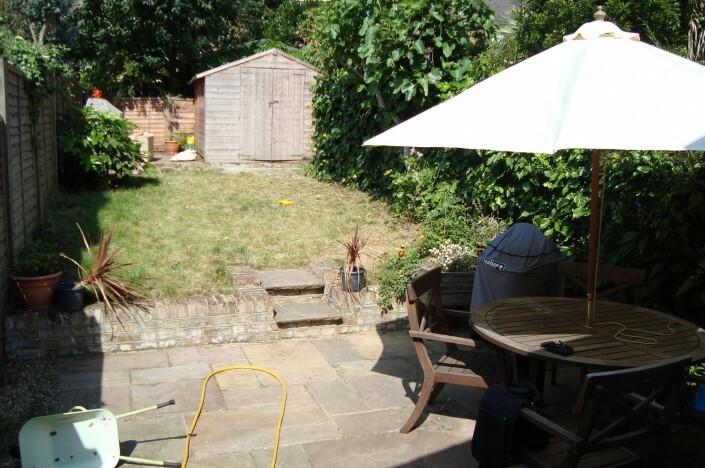 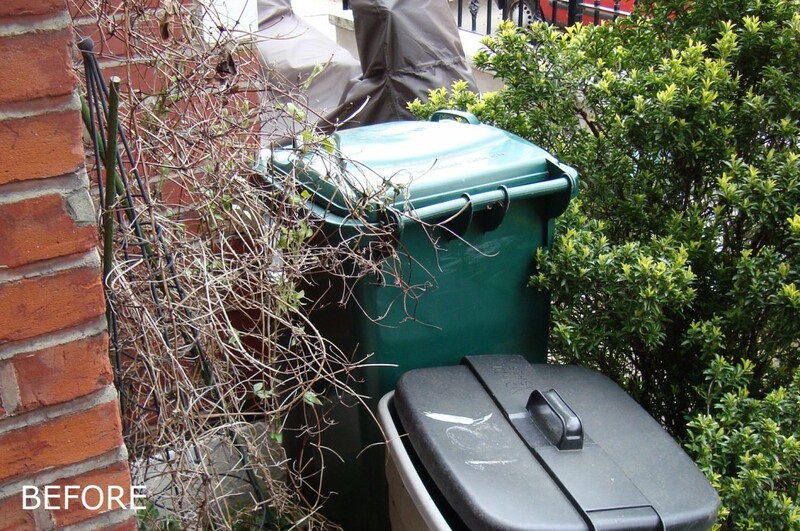 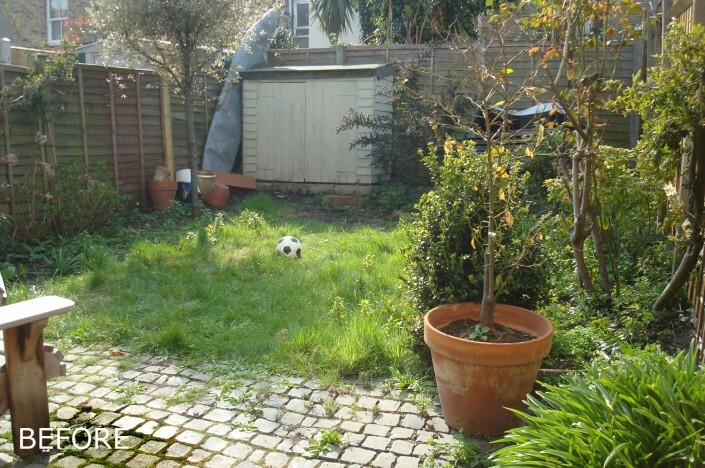 The small urban garden at this Clapham home was rather tired, uninspiring and neglected and as such was not being used by the owner. 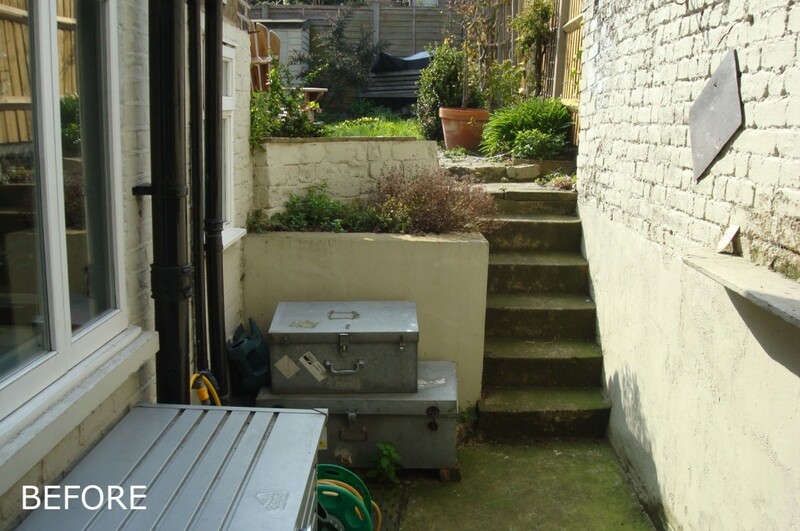 It also had some odd proportions with a long side return and a small rear courtyard. Landspace Design took the Japanese influence of the client’s minimalist interior and reflected it into the final garden design outside. 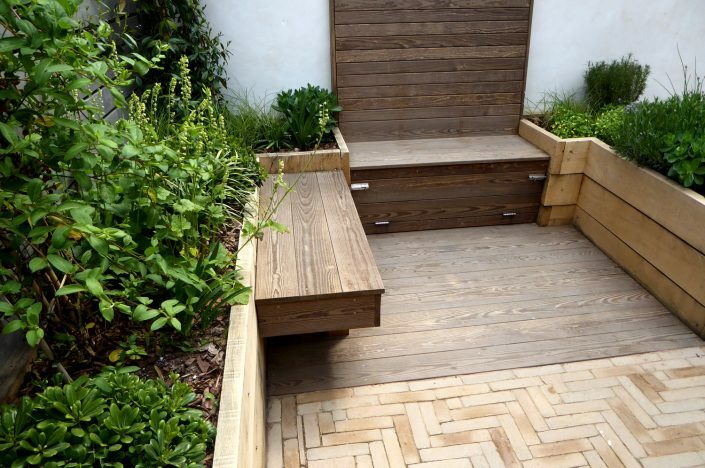 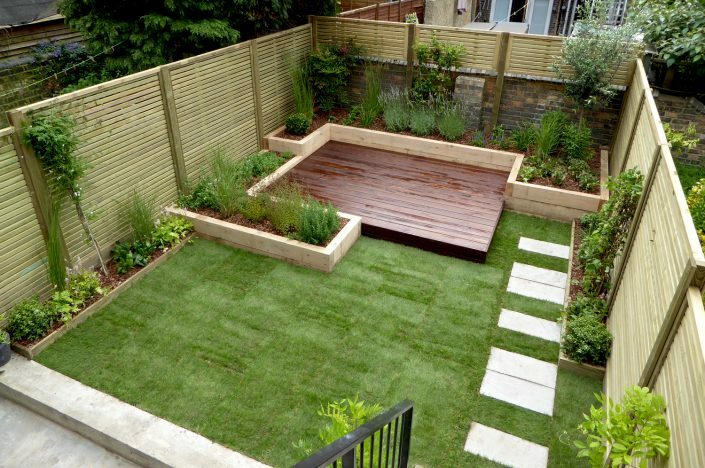 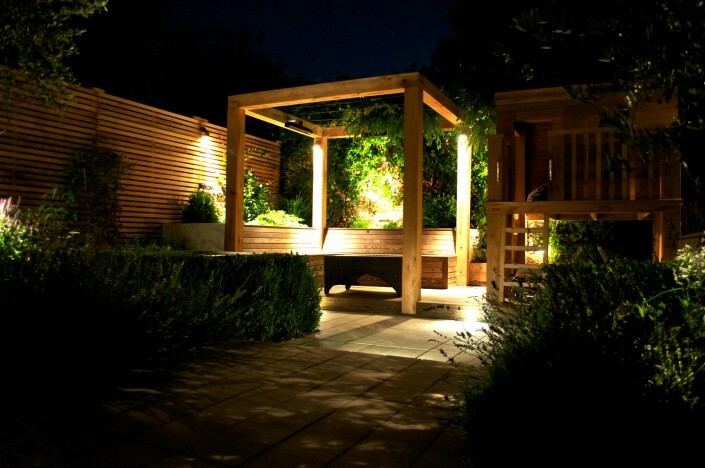 The solution included a garden which was divided into distinct areas including decking, a stepping stone path, a beautiful patio, raised beds, dark stained planters set against a lovely slatted Cedar fence and a vibrant planting scheme. 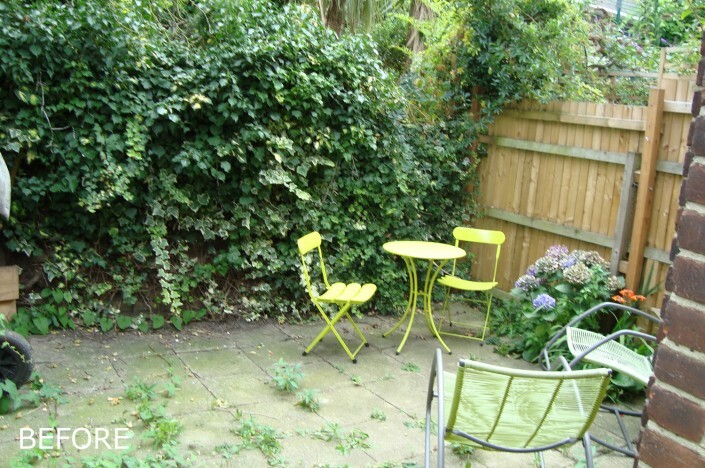 To learn more about this small garden makeover, click here. 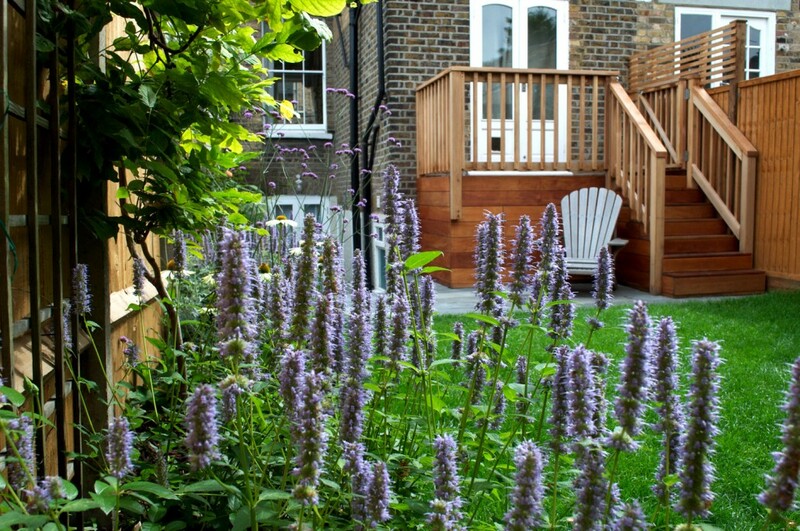 For this Victorian property in Kew, Landspace Design were commissioned to turn what was previously an uninspiring, bland and tired-looking space into a low maintenance, contemporary and private family garden which incorporates both shady and sunny areas, several terraces, an ambient water wall feature, a place or adults to relax with friends and a special climbing and storage area for children. 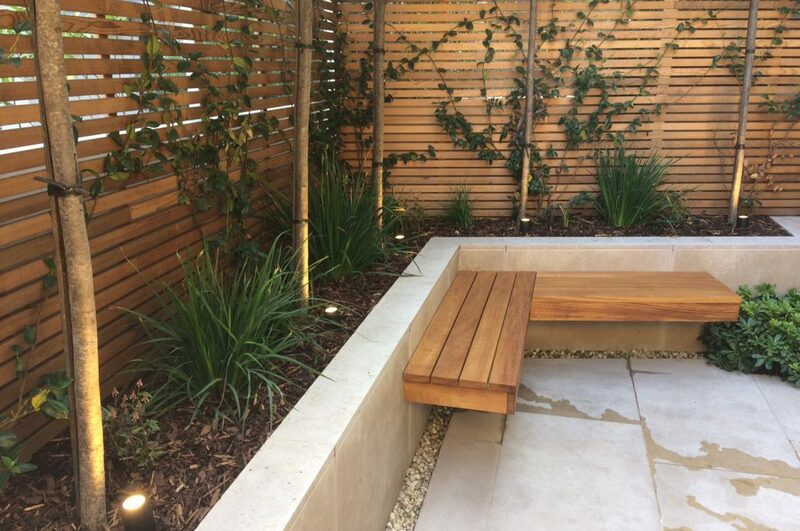 To learn more about how Landspace Design remodelled this urban garden into a contemporary and secluded retreat, with a Mediterranean flavour, click here. 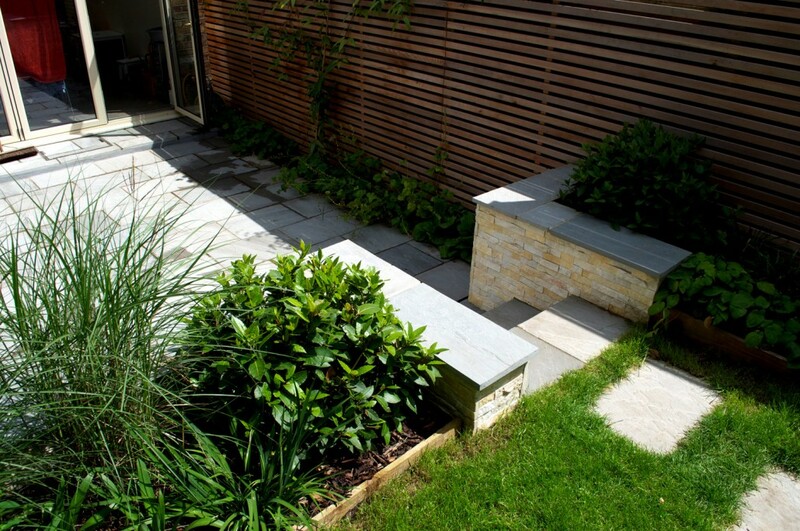 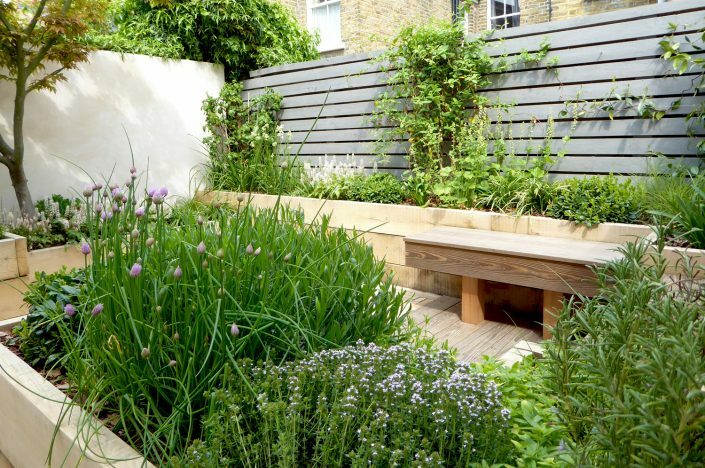 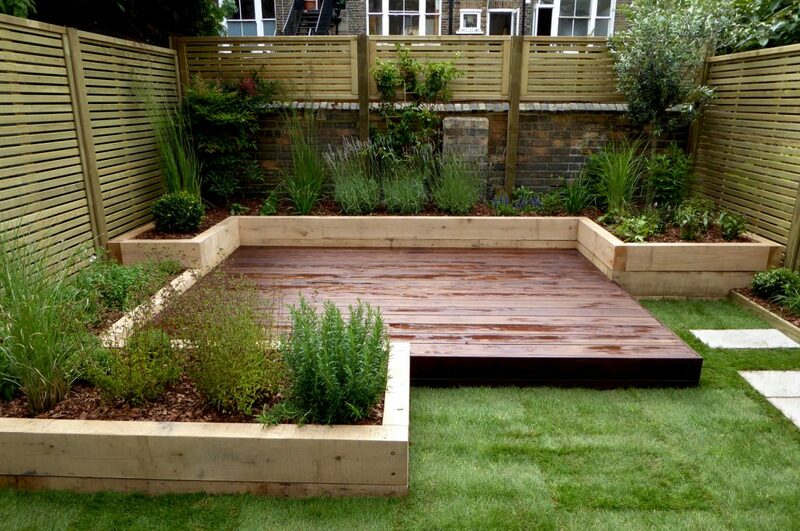 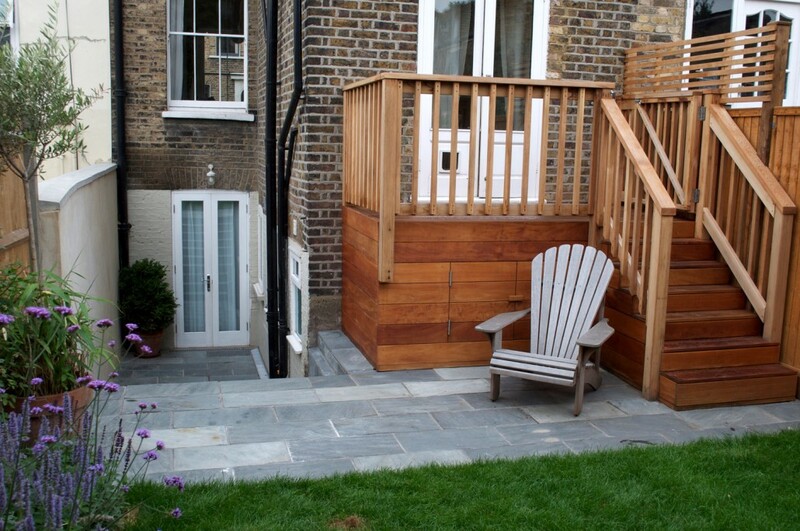 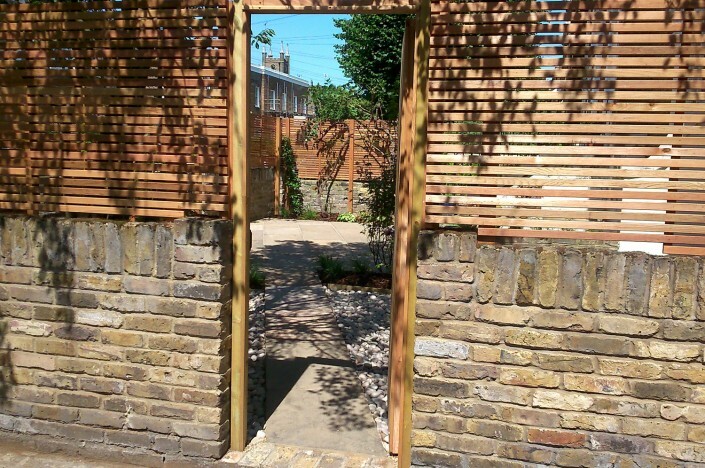 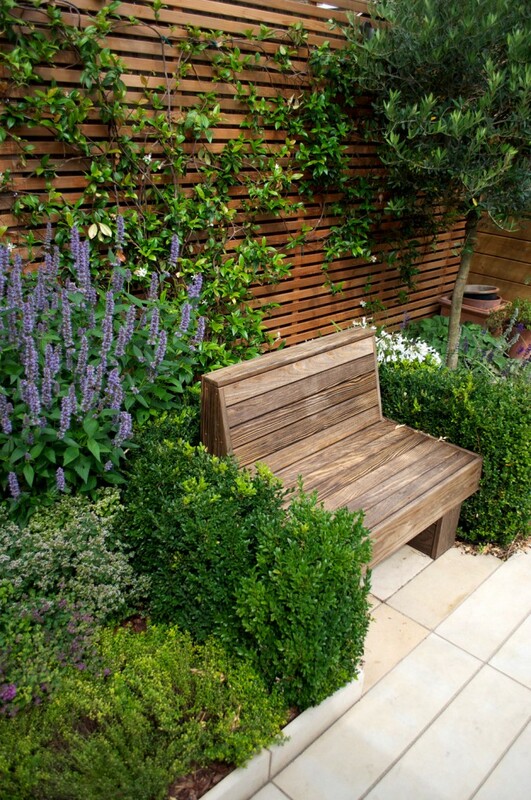 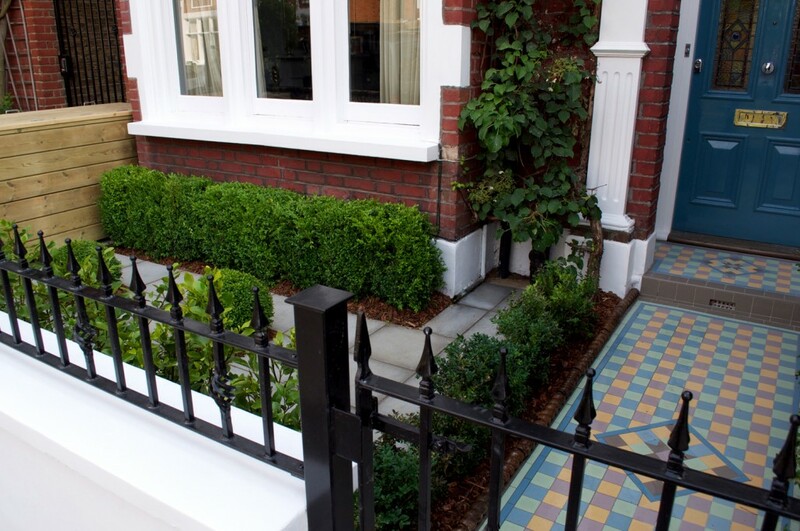 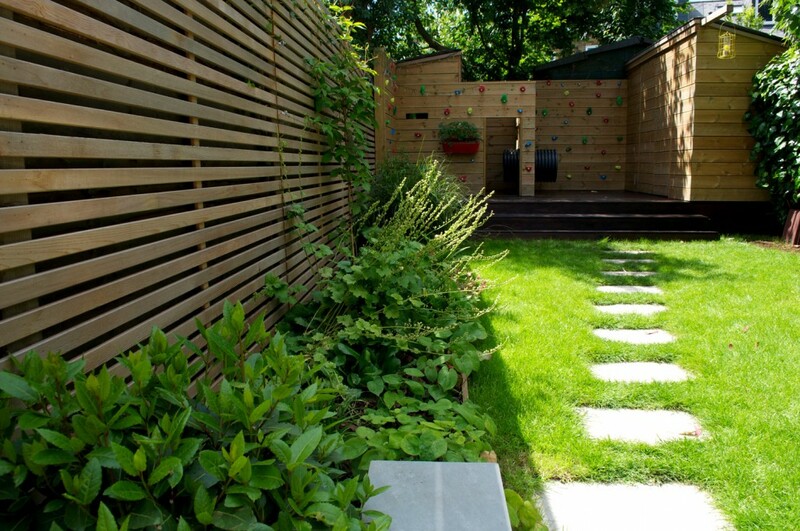 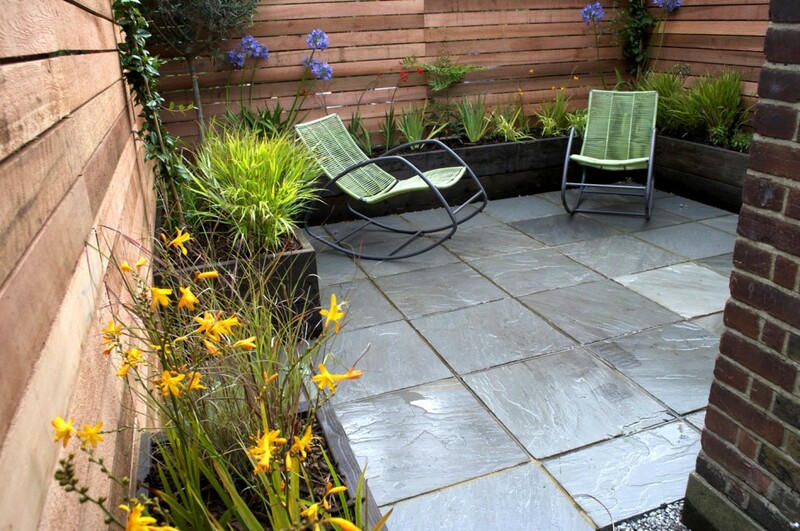 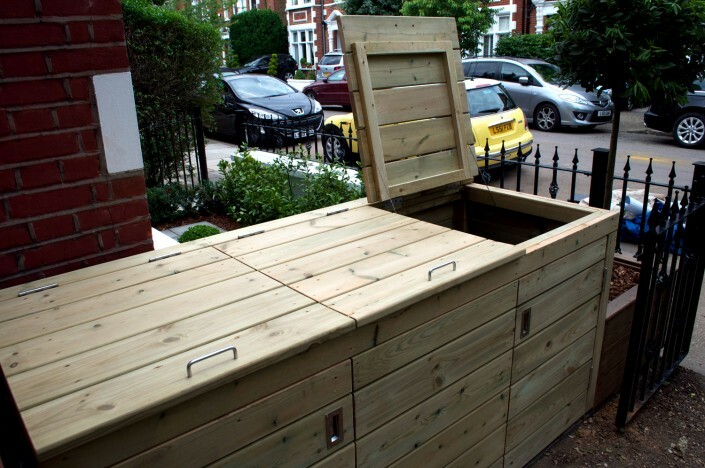 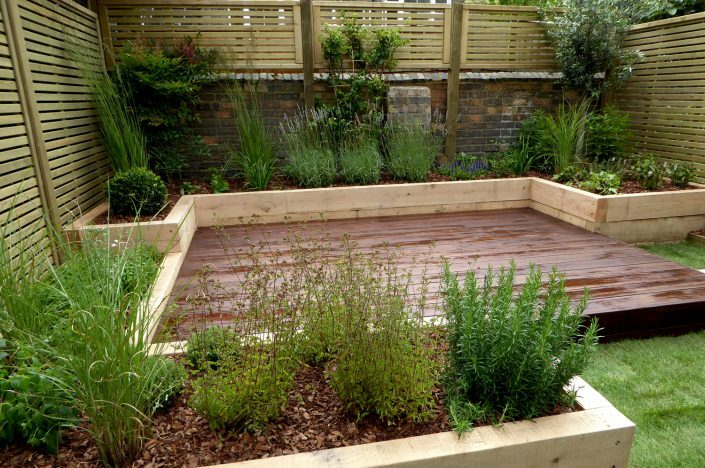 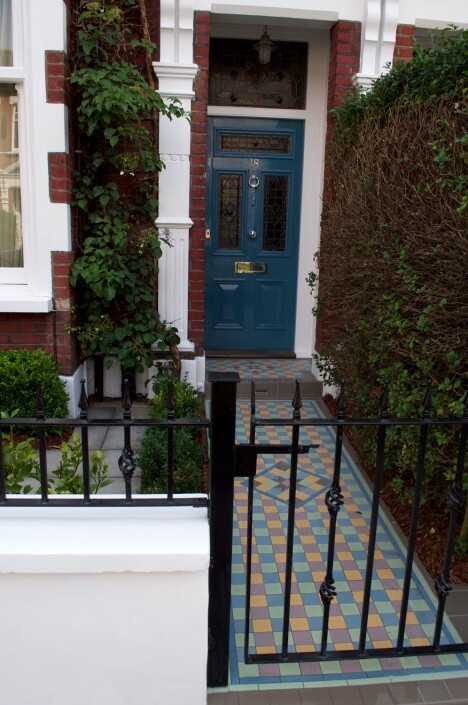 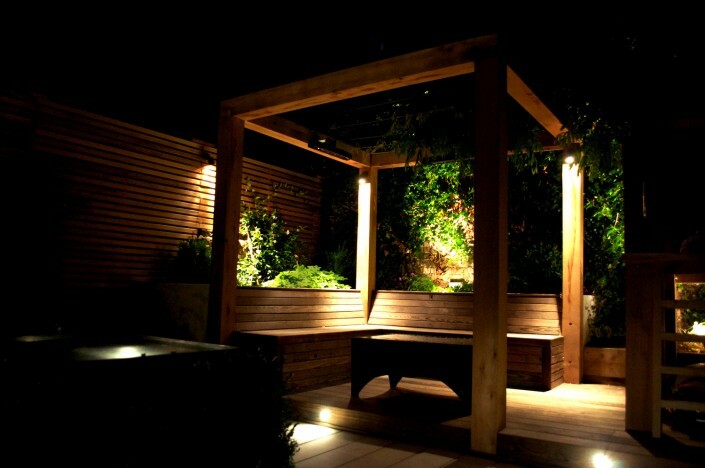 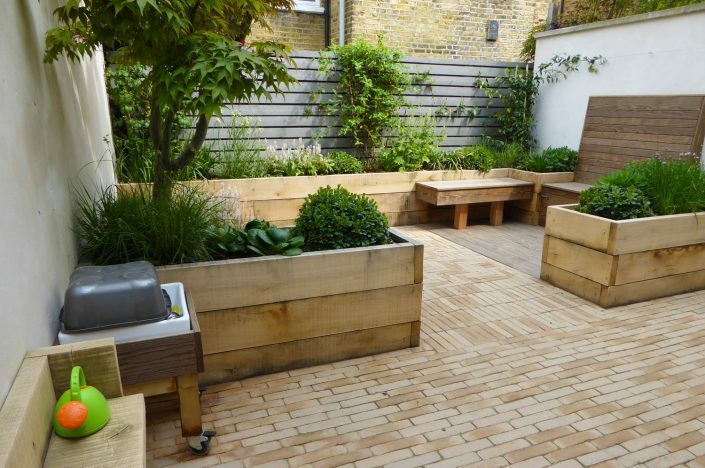 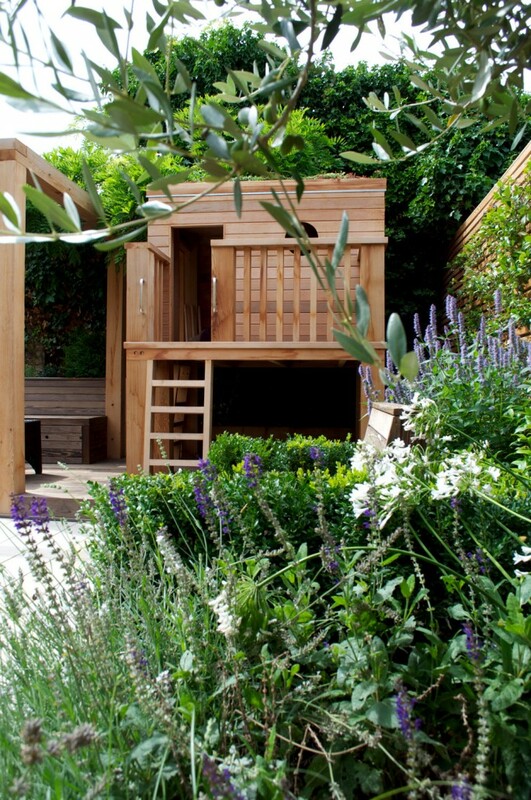 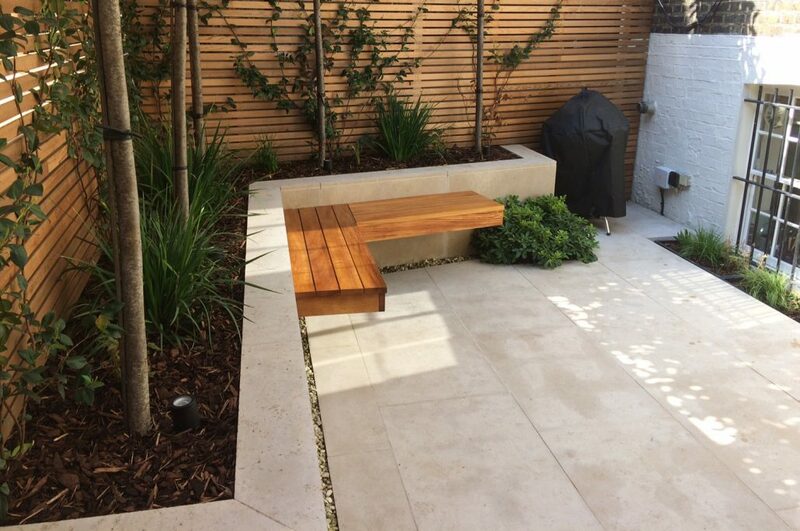 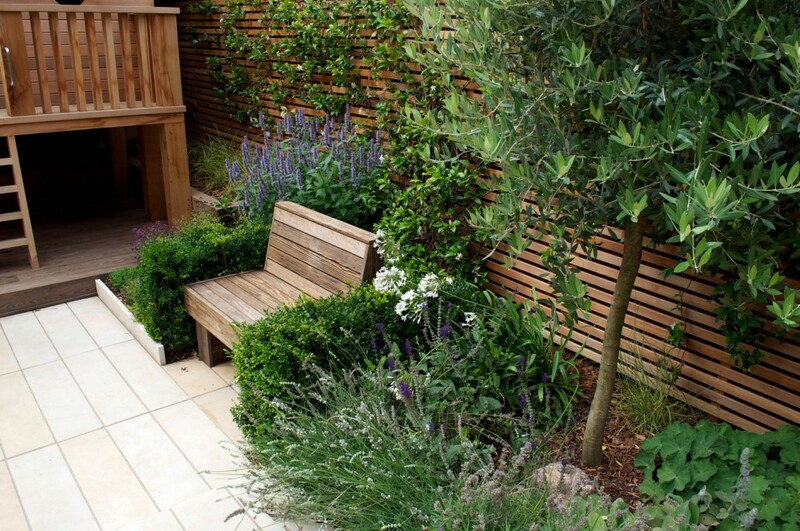 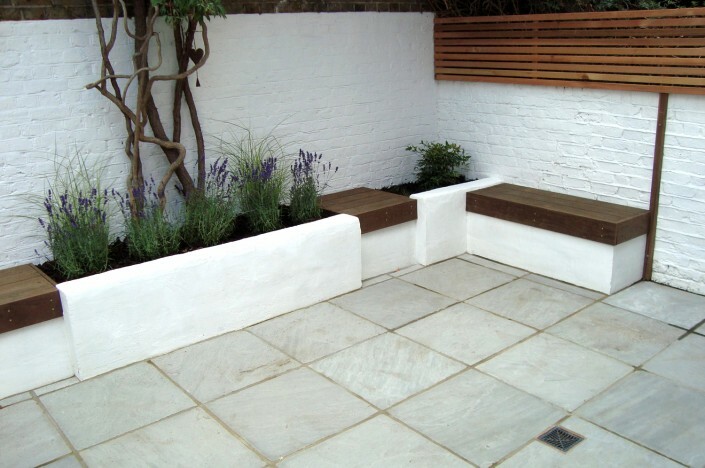 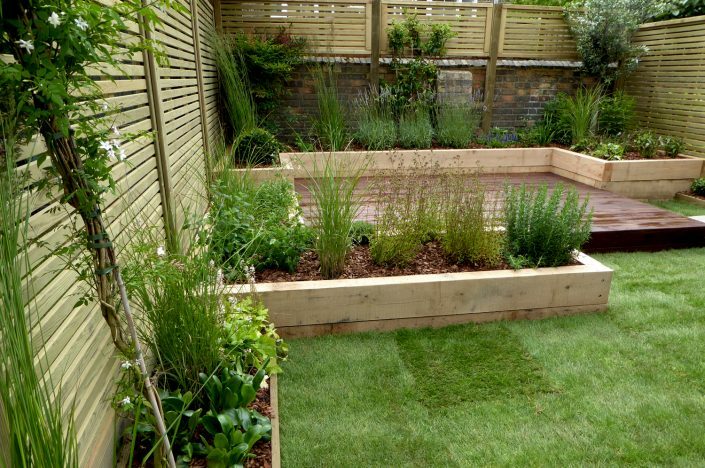 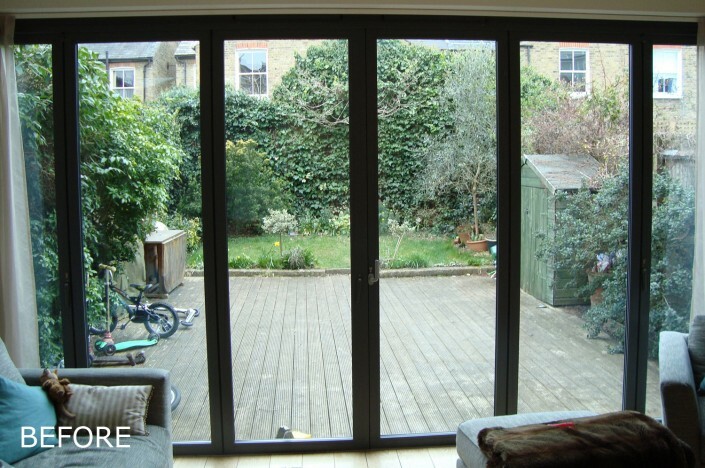 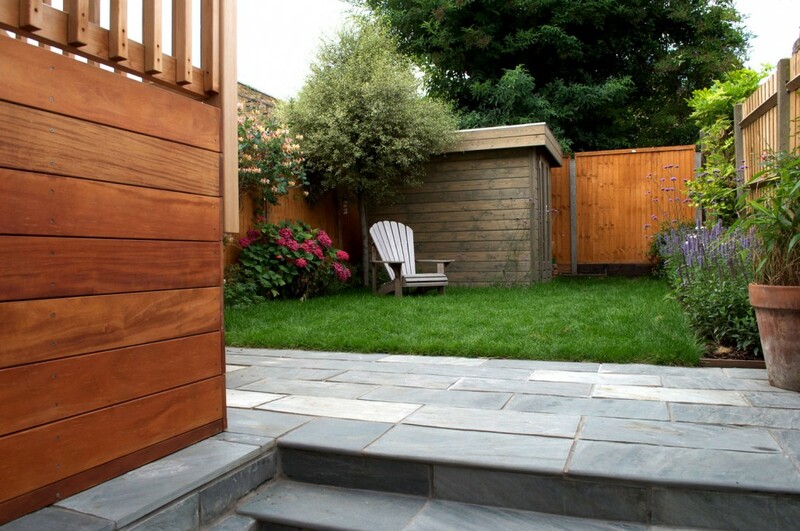 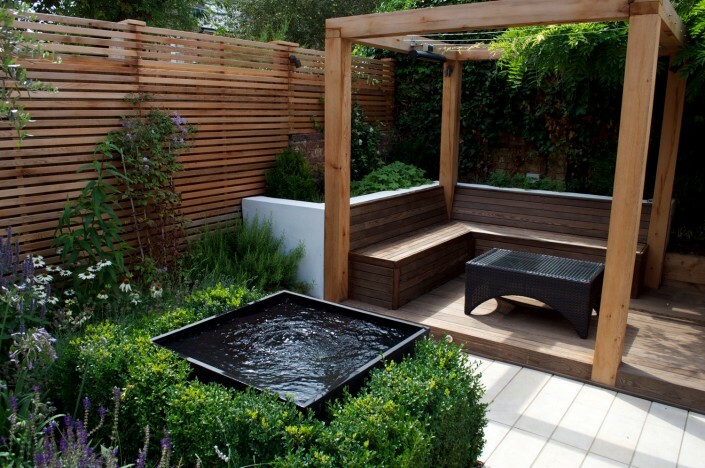 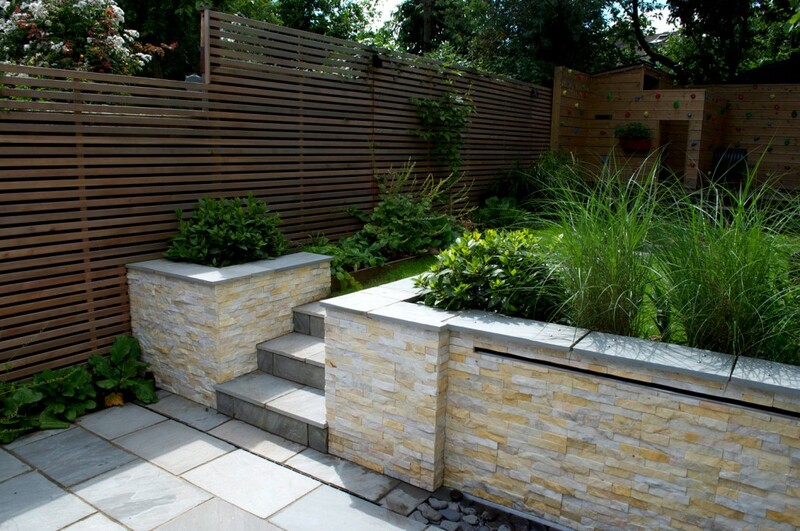 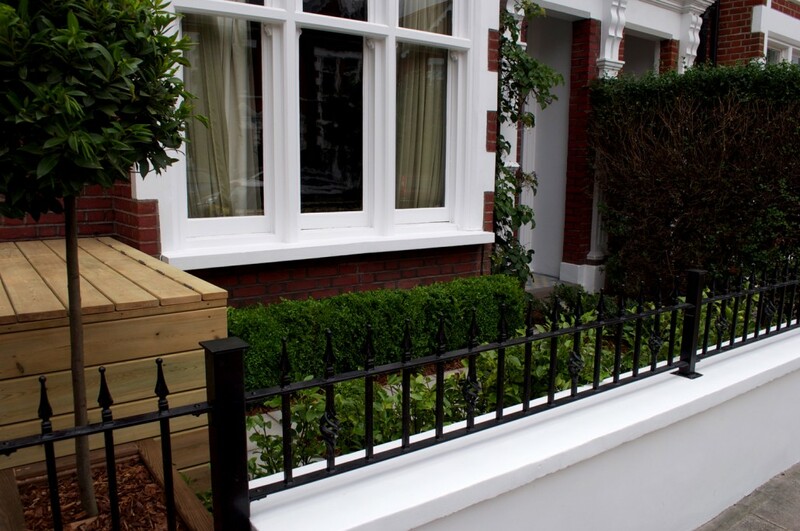 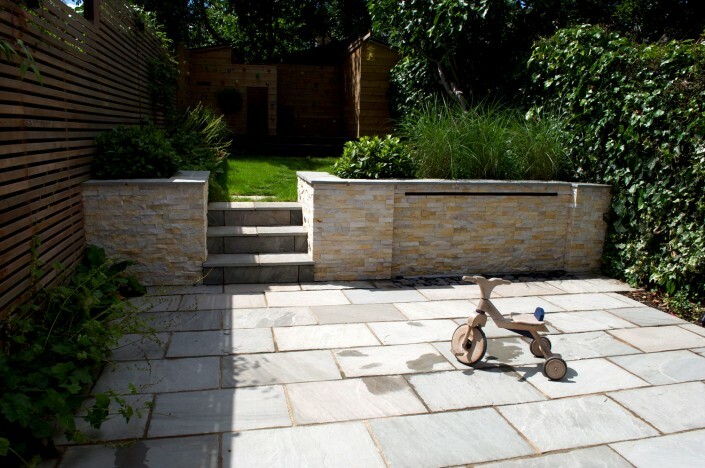 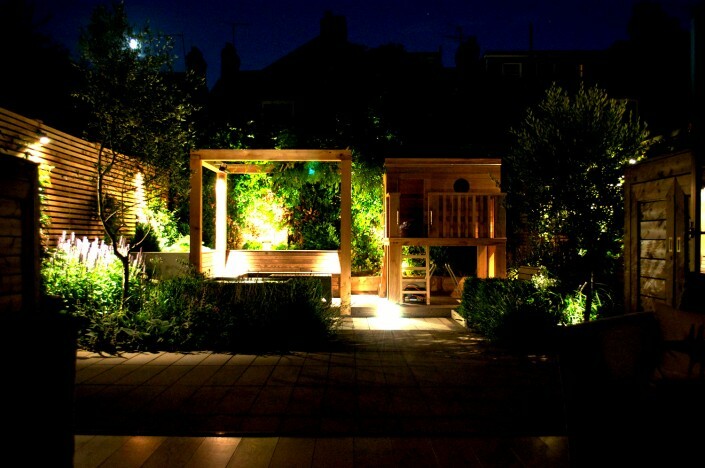 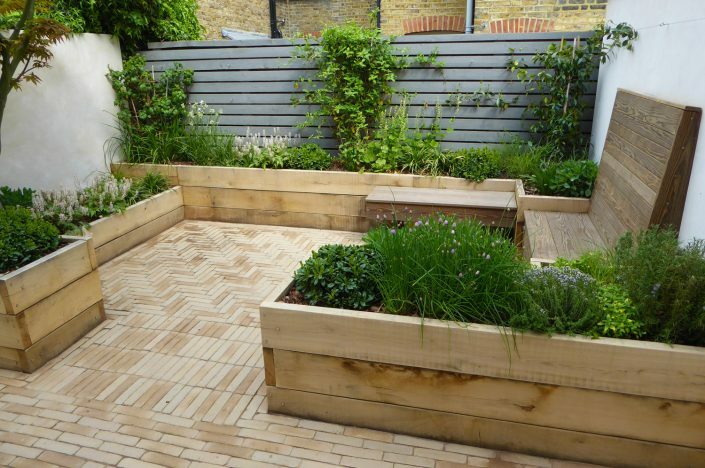 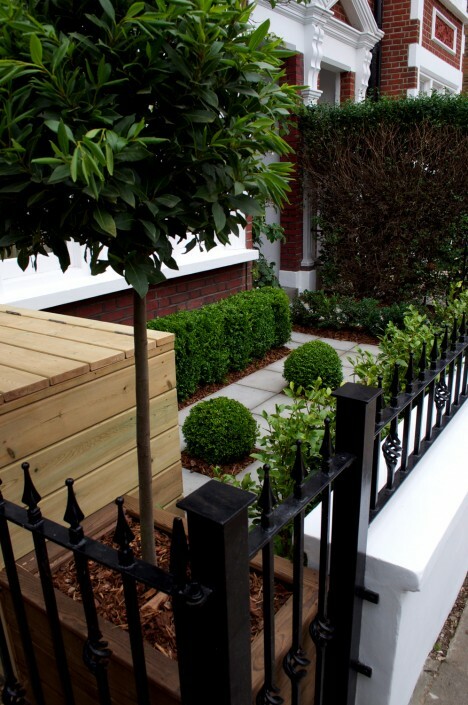 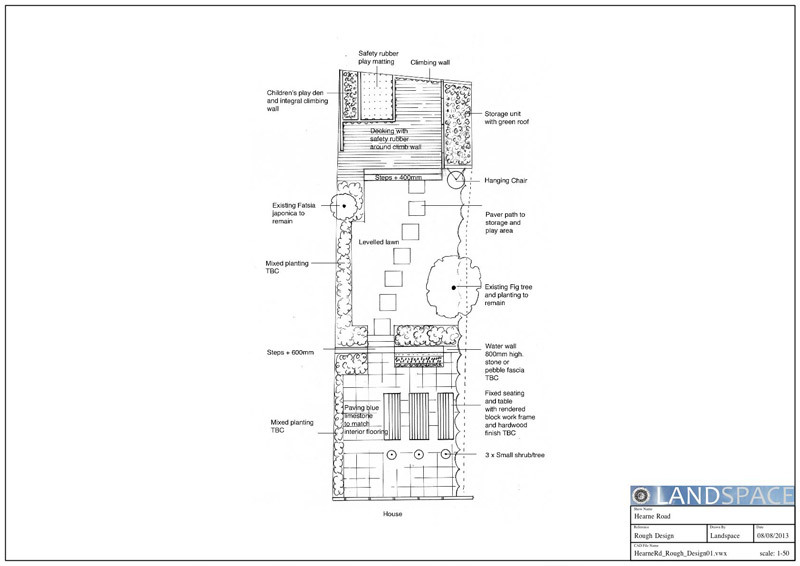 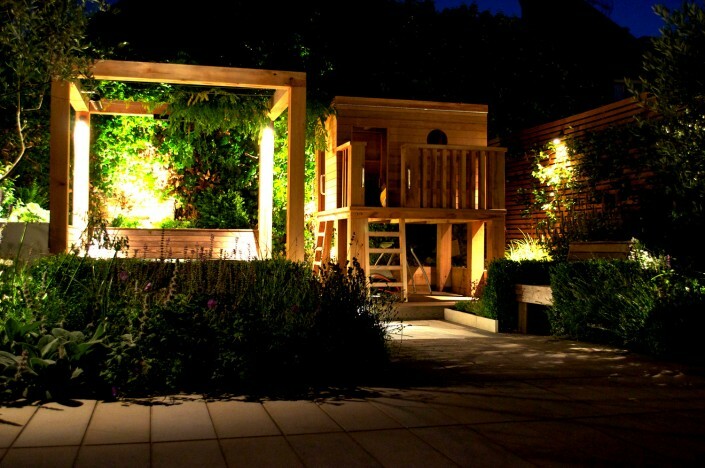 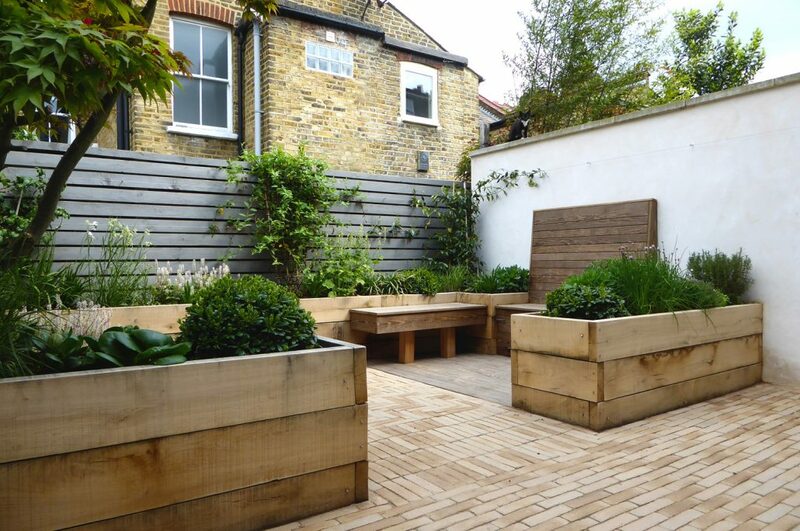 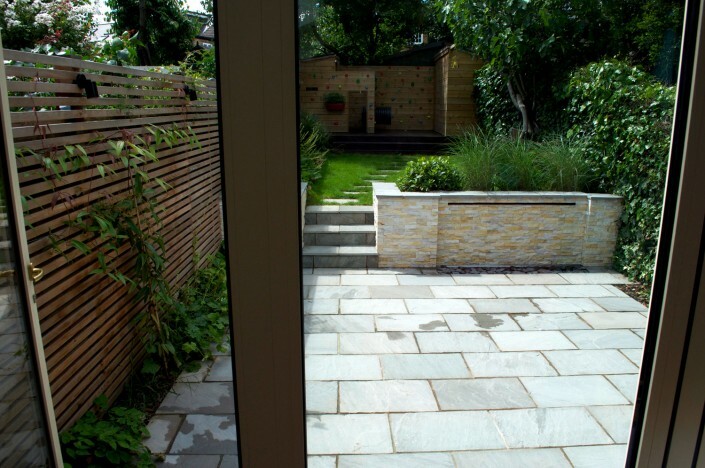 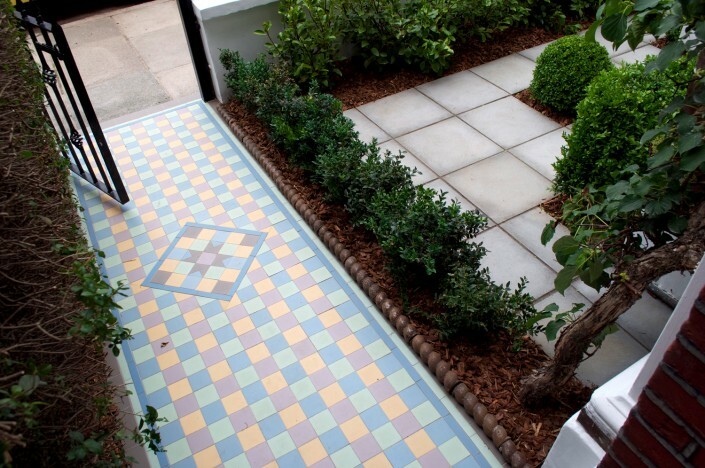 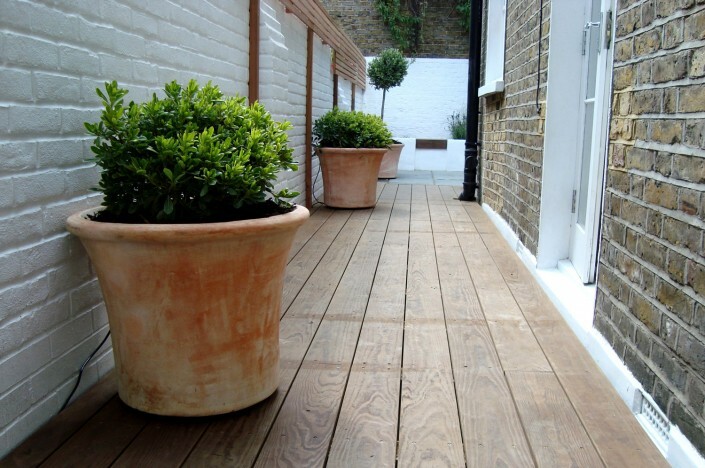 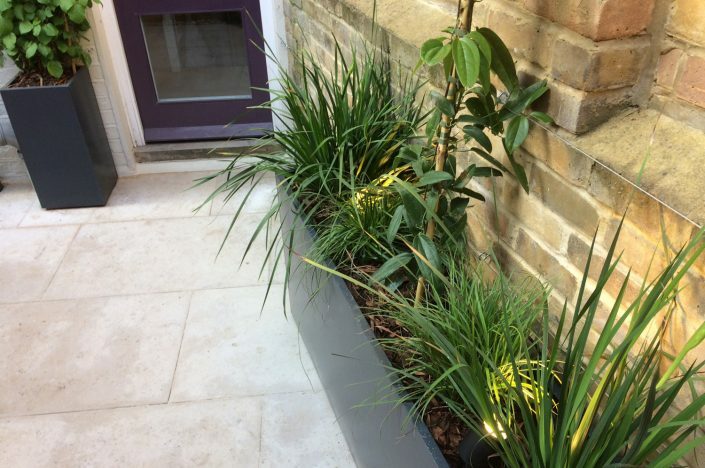 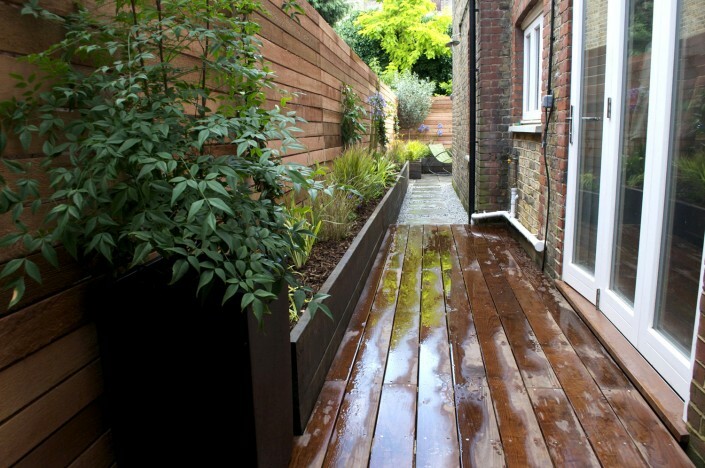 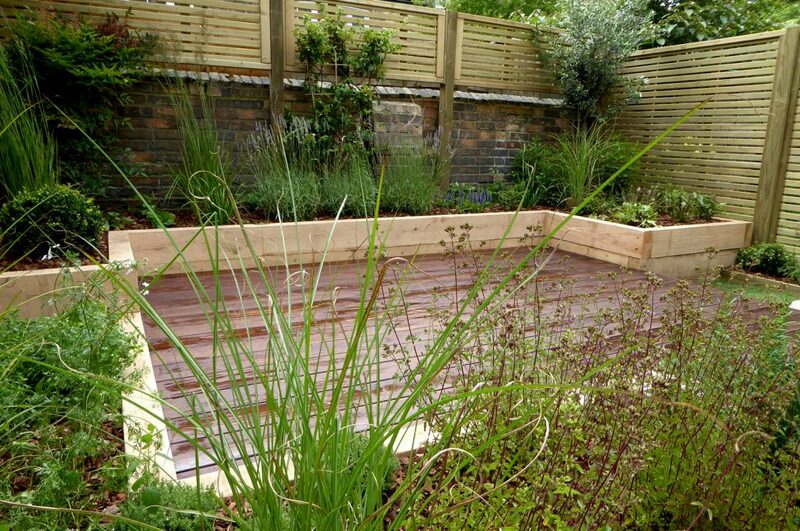 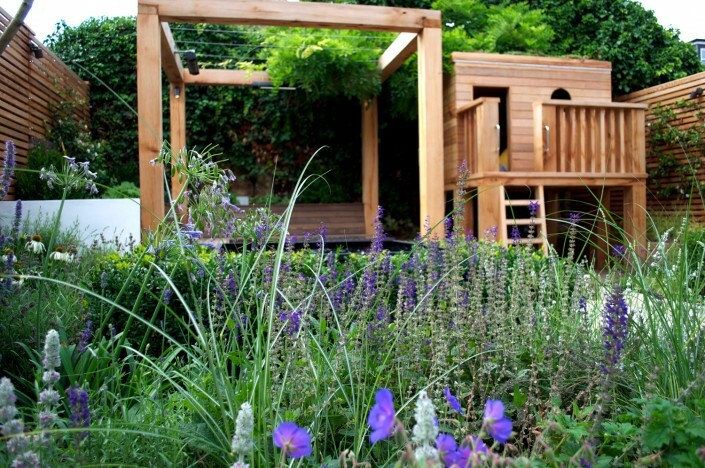 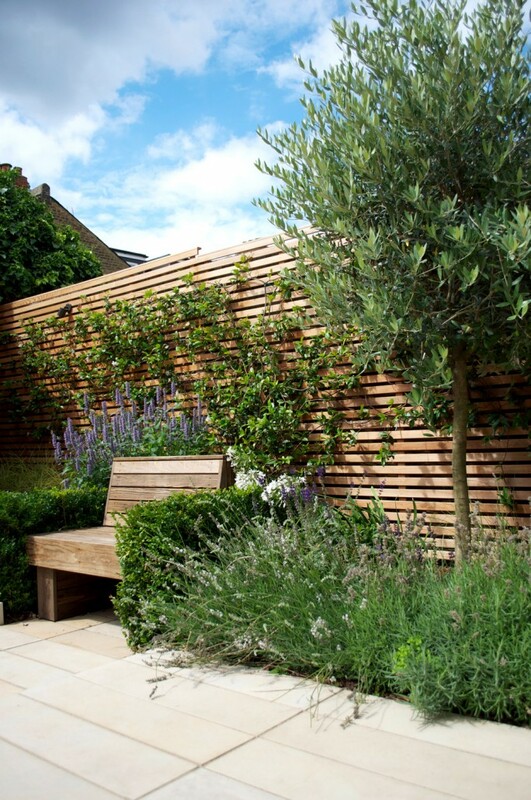 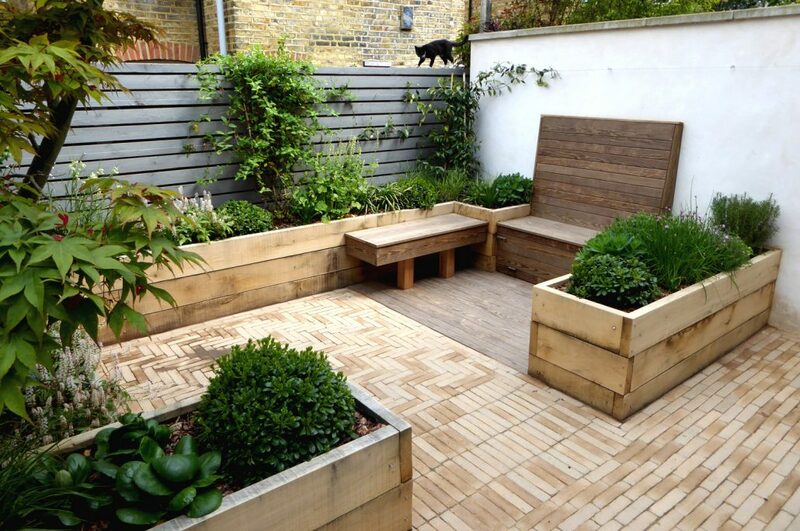 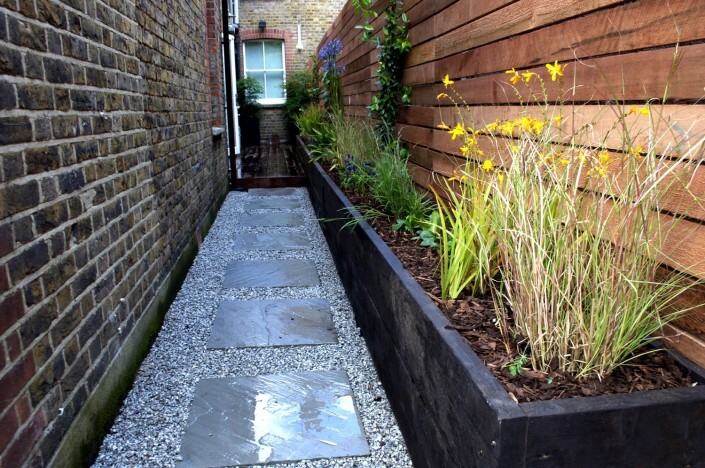 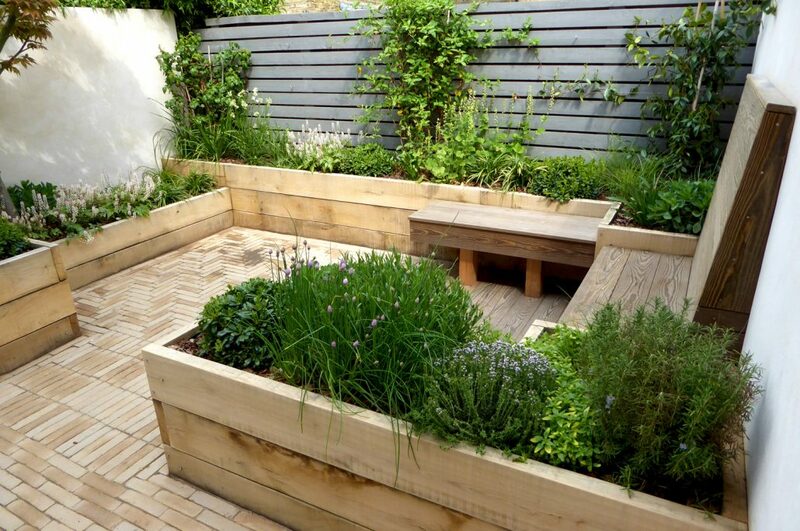 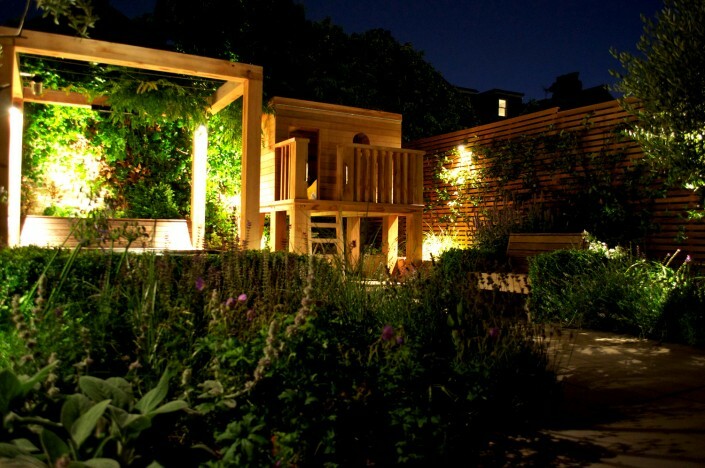 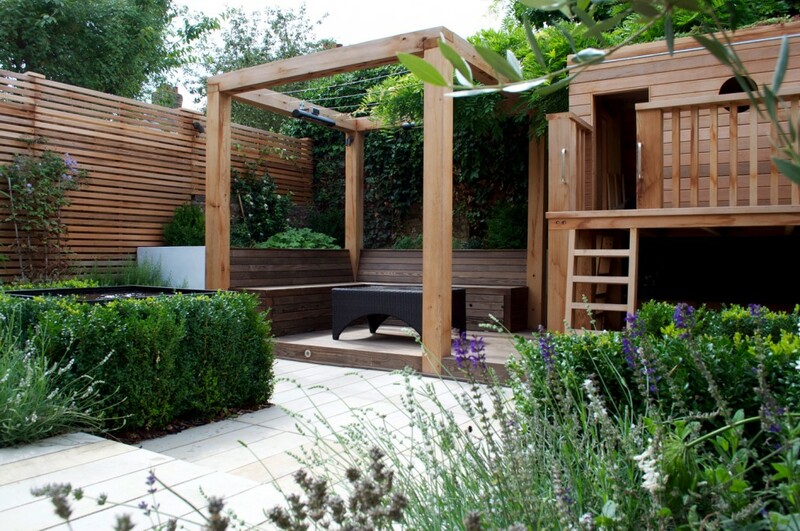 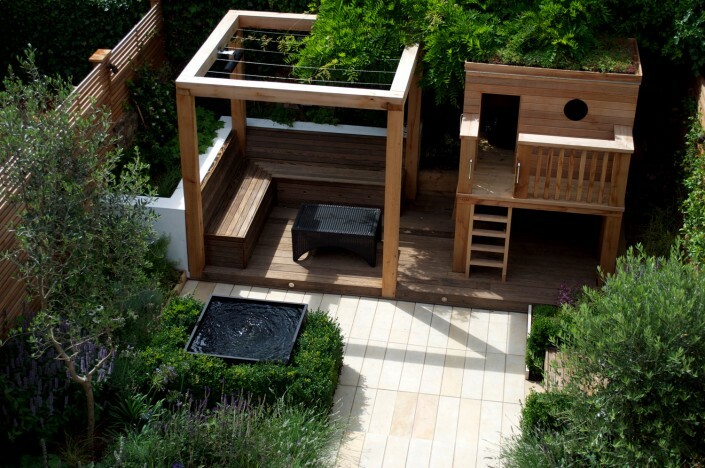 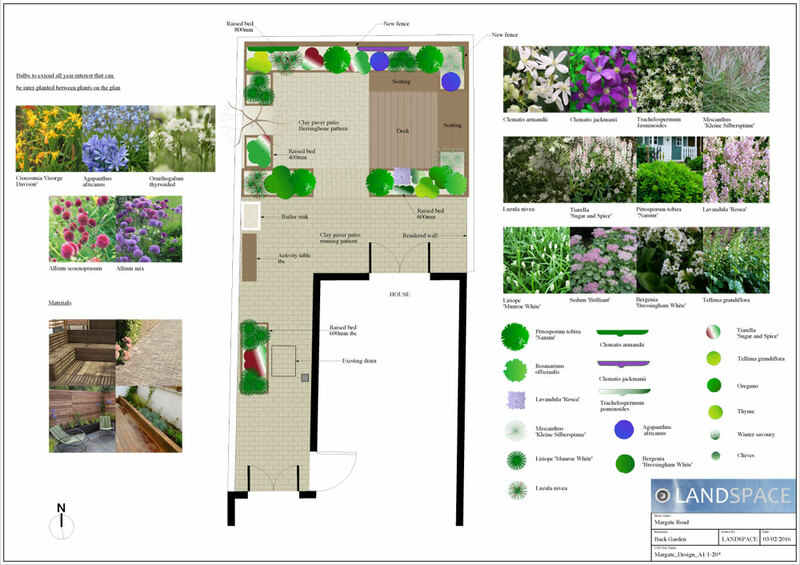 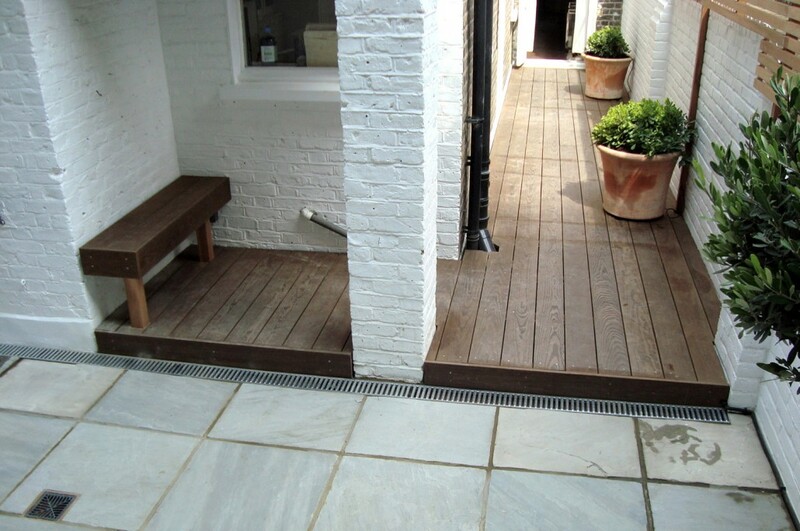 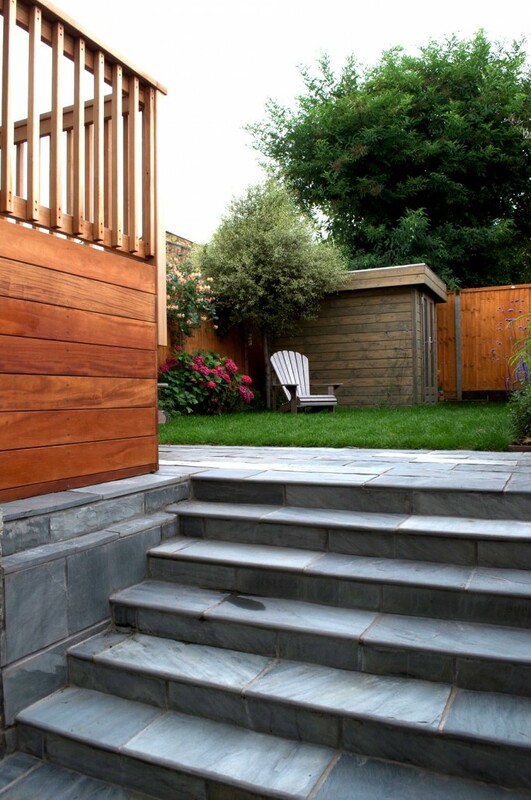 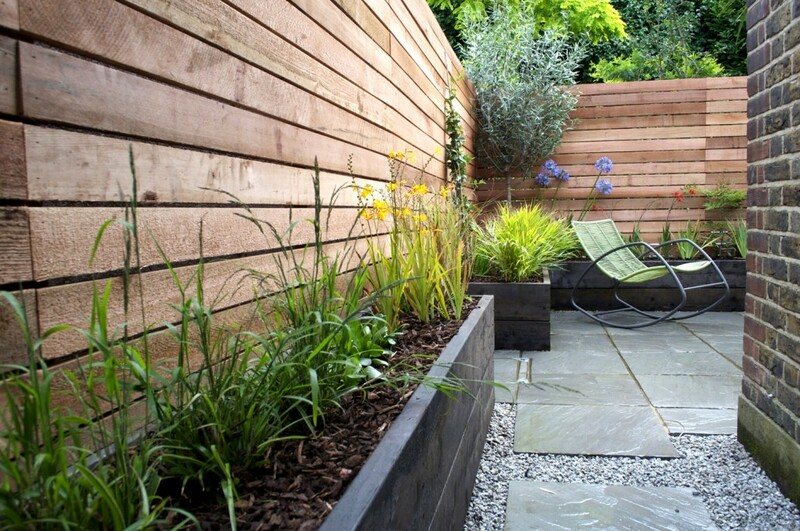 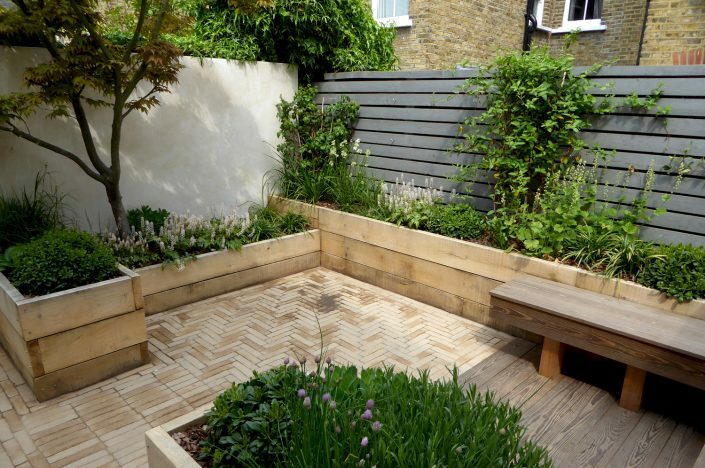 A garden on a corner plot in Islington was given a complete make-over by Landspace Design. 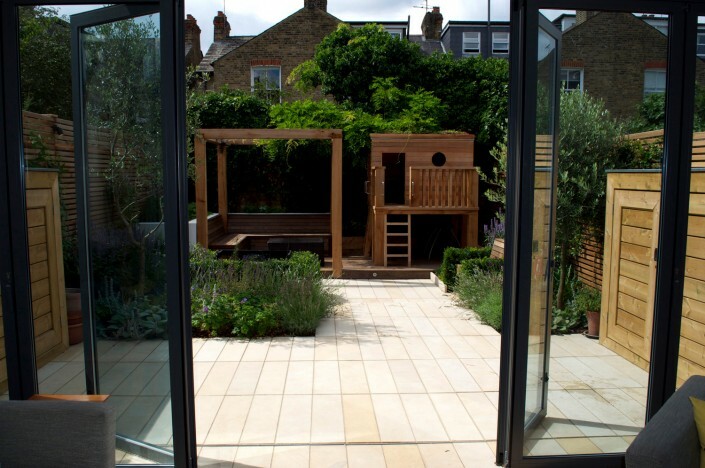 What was previously under-used, neglected and overlooked was designed in such a way so as to provide privacy without compromising light and the feeling of space. 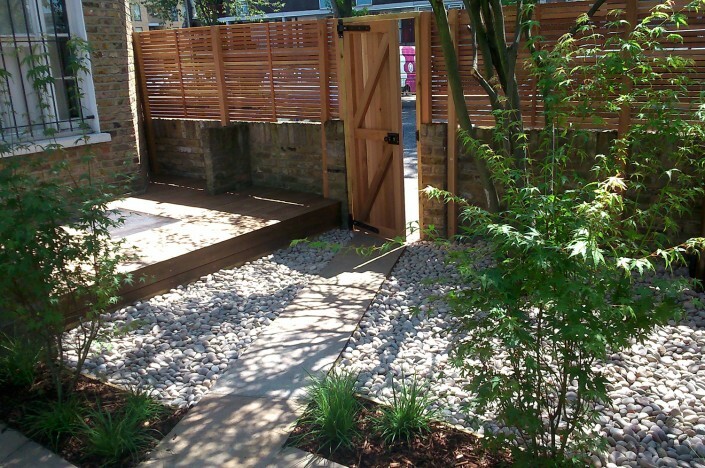 The outcome included attractive paths, a decking area and hard landscaping offset by soft, Japanese style planting. 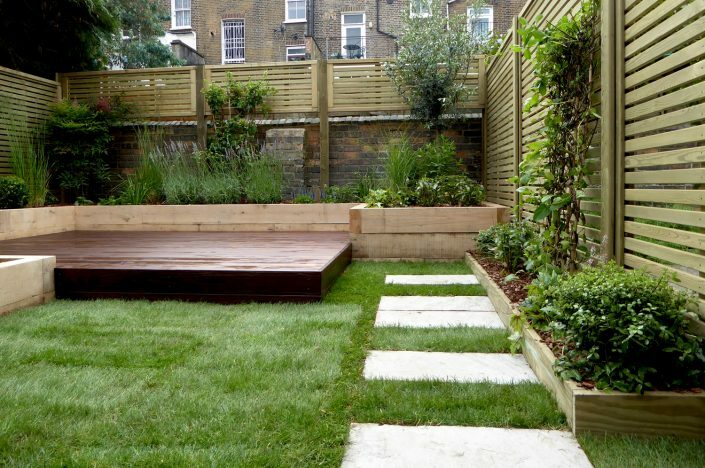 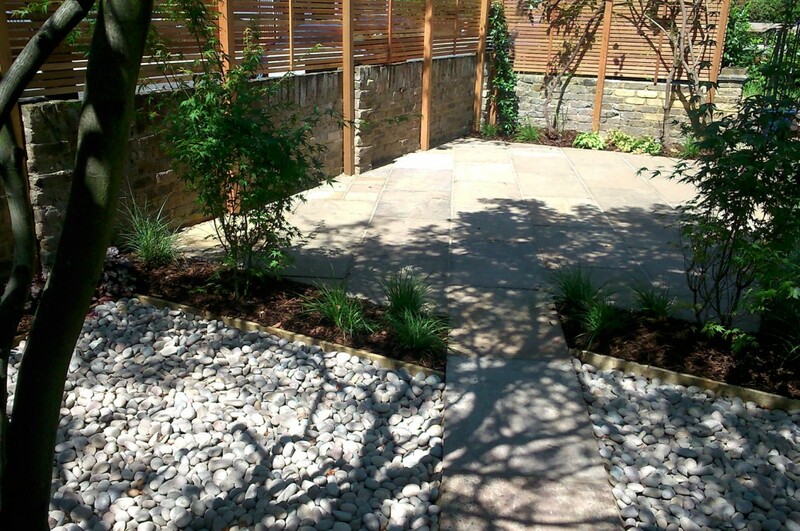 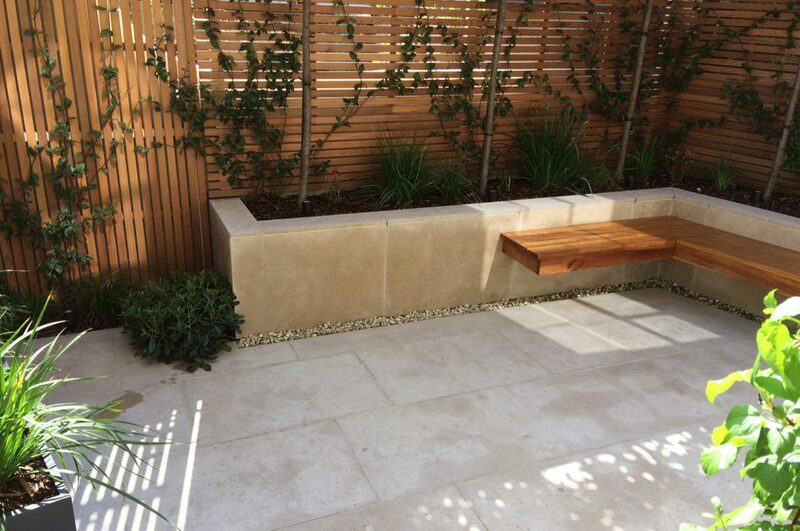 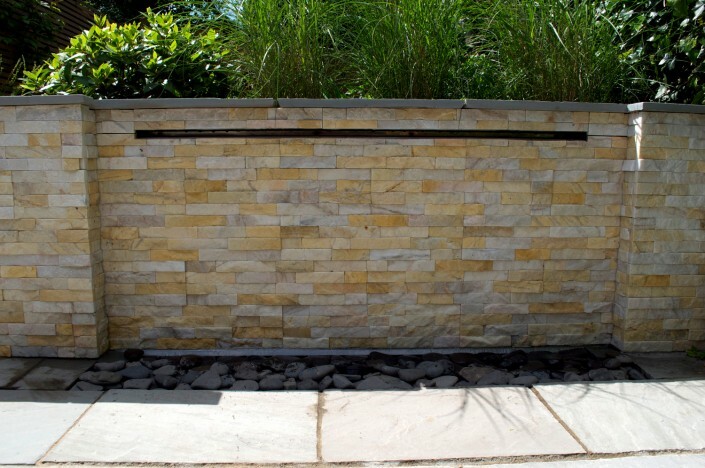 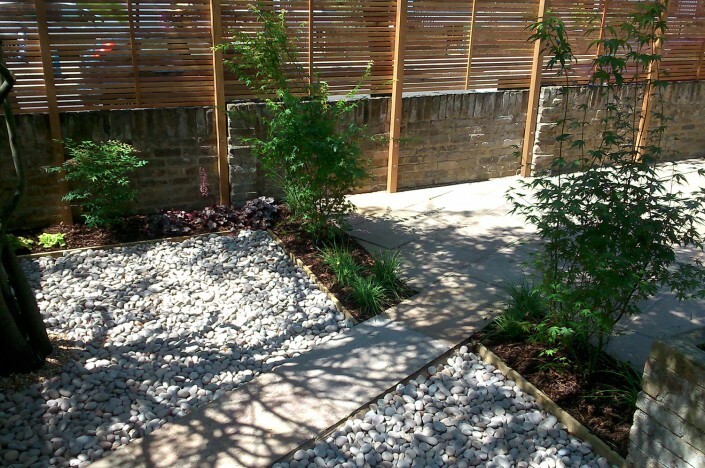 The finished result is a low-to-medium maintenance garden space with a minimalist, modern feel. 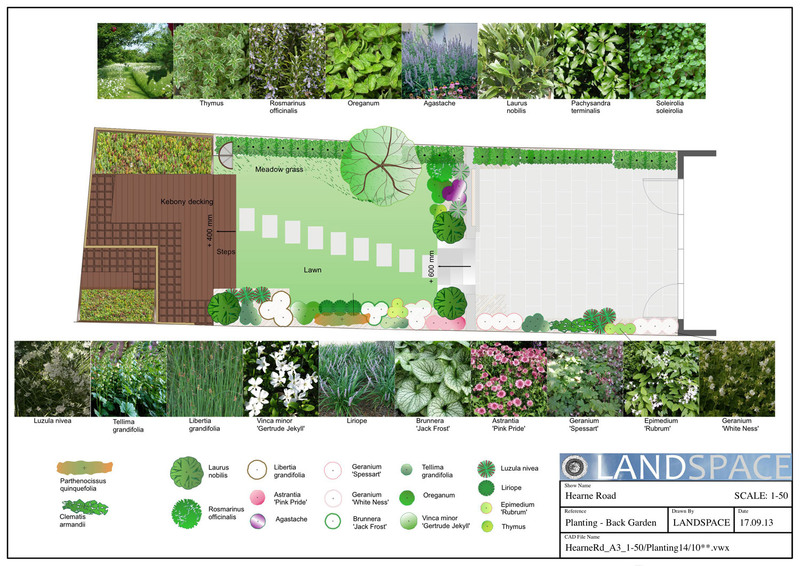 Learn more about this garden project by clicking here. 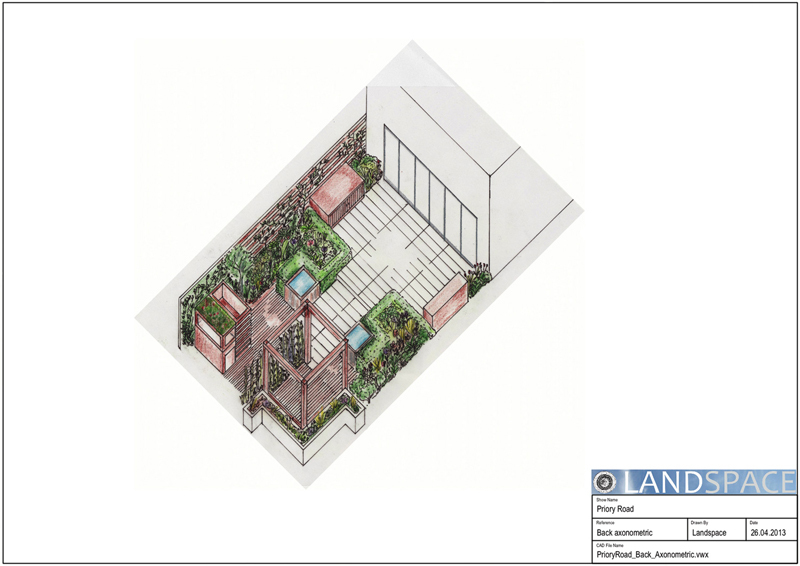 This garden landscaping was a little more unusual for us at Landspace Design because, in this instance, our customer had his own designs already. 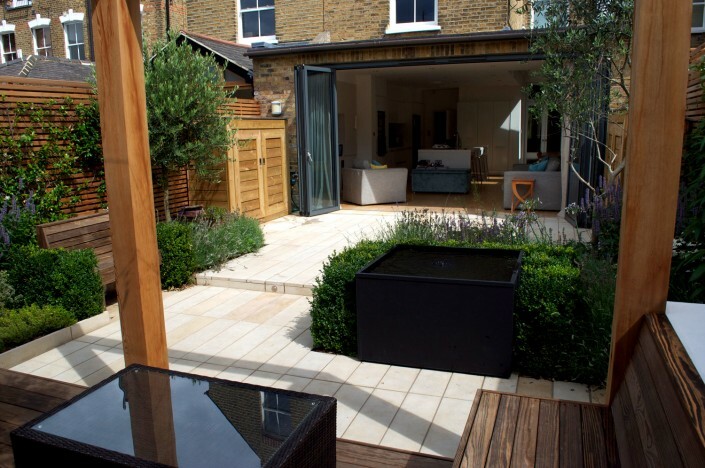 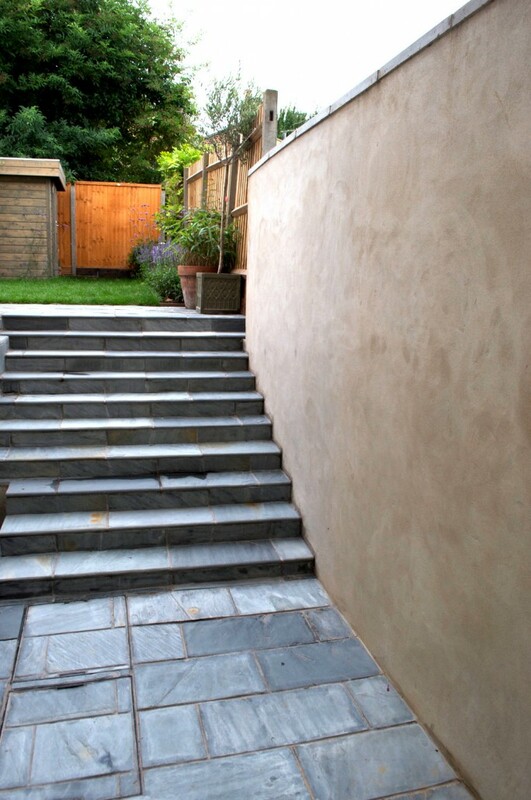 But that wasn’t a problem — we implemented and built to the client’s specifications and this included green slate paving, rendered walls, a hidden storage area, hardwood balcony decking and decked stairs leading from the first floor to the lovely finished garden. 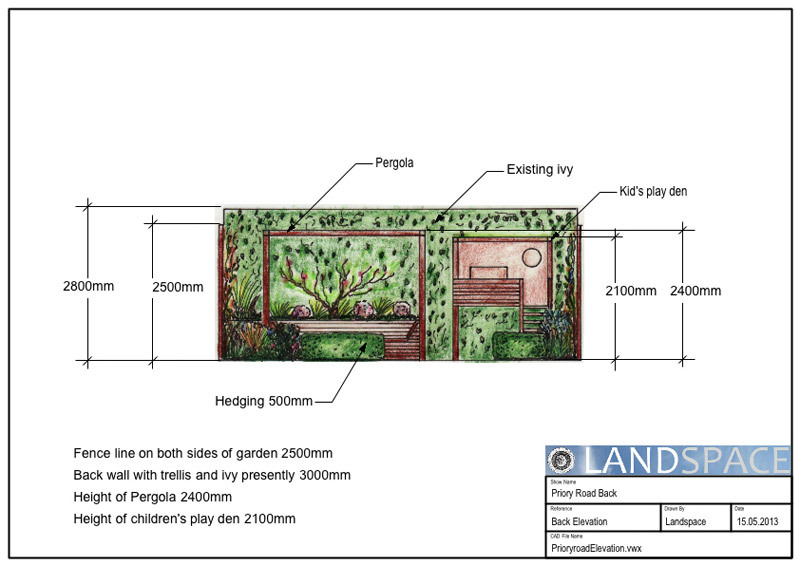 Read more about this garden project here. 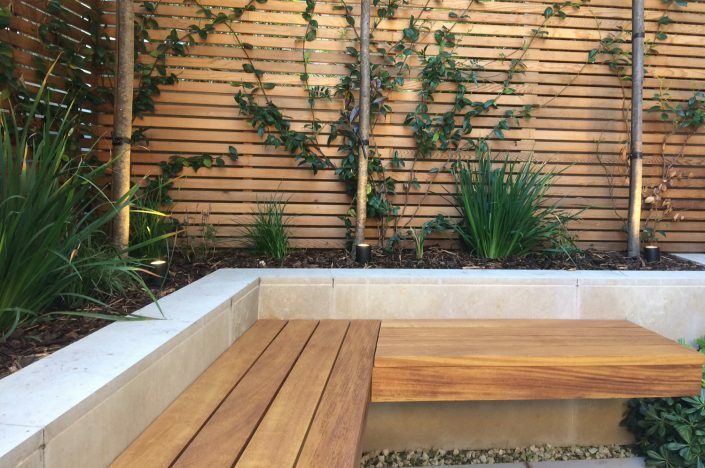 Brief: Our brief was to transform a small, town house garden in Clapham which would incorporate a pleasant courtyard space for relaxing in after work or at weekends. 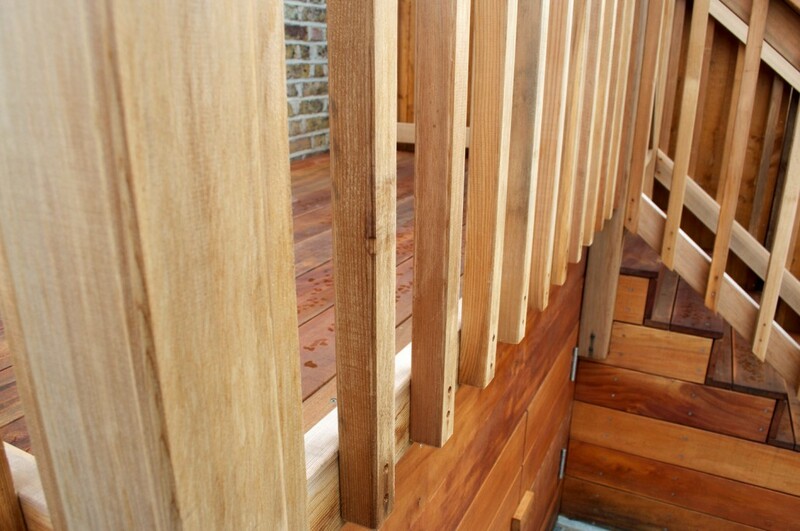 A dysfunctional side return also required a structural and aesthetic make-over. 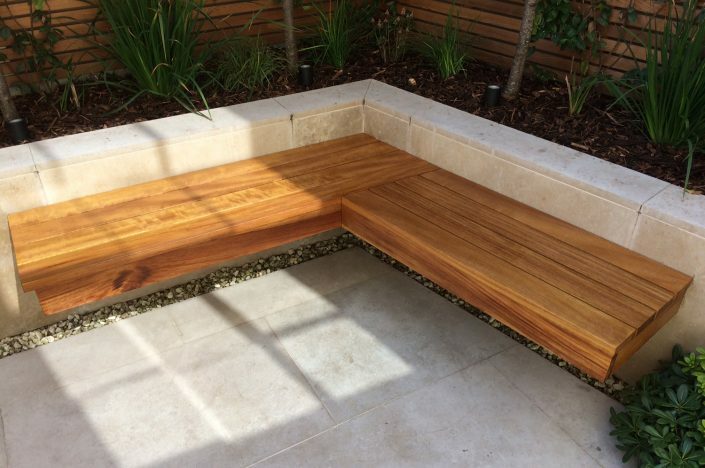 The final result was a low maintenance, minimalist design with a bright, Mediterranean feel which incorporated kebony decking and seating, terracotta pots, cedar trellis and grey sandstone paving. 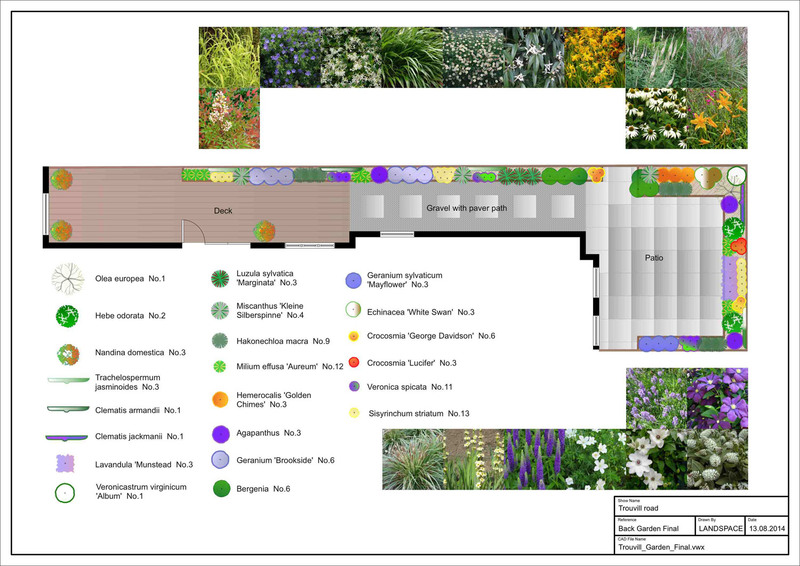 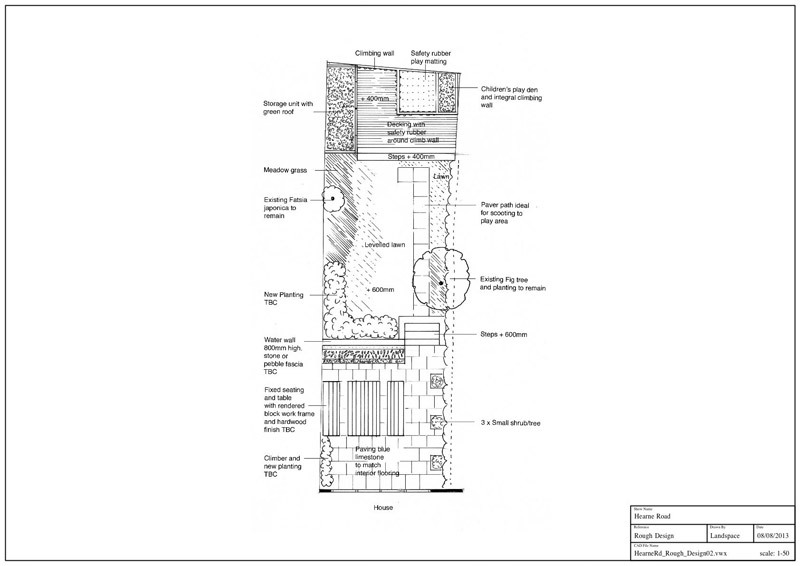 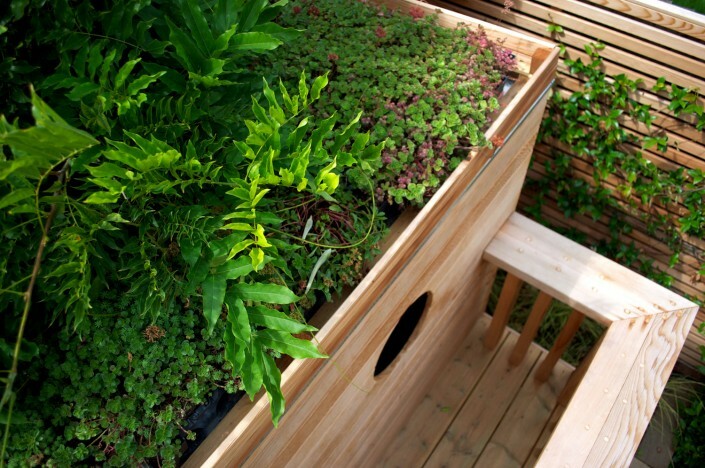 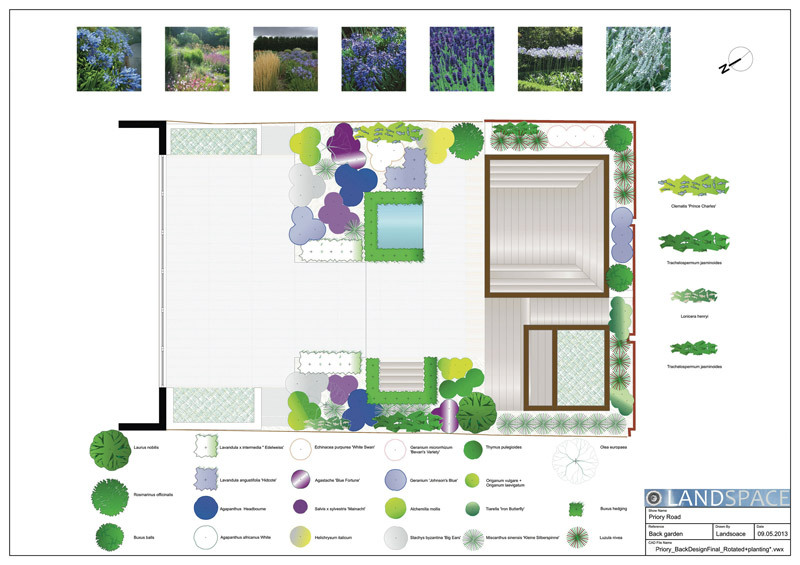 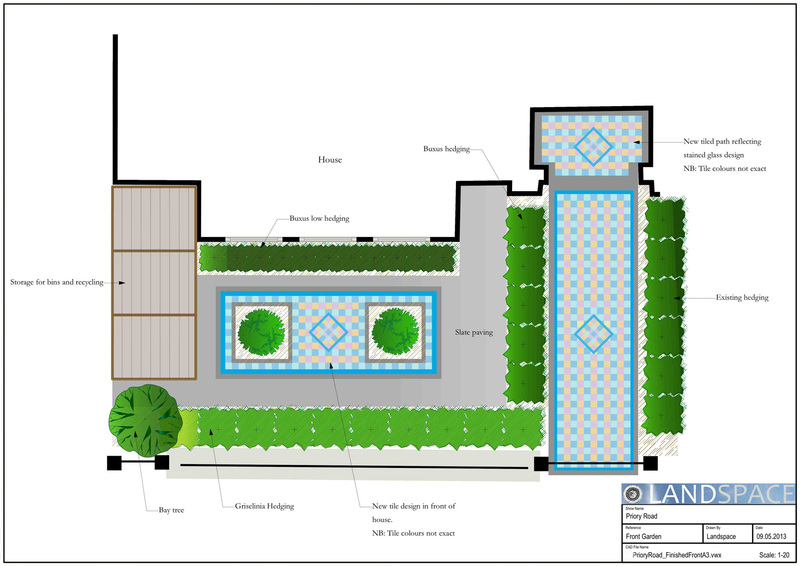 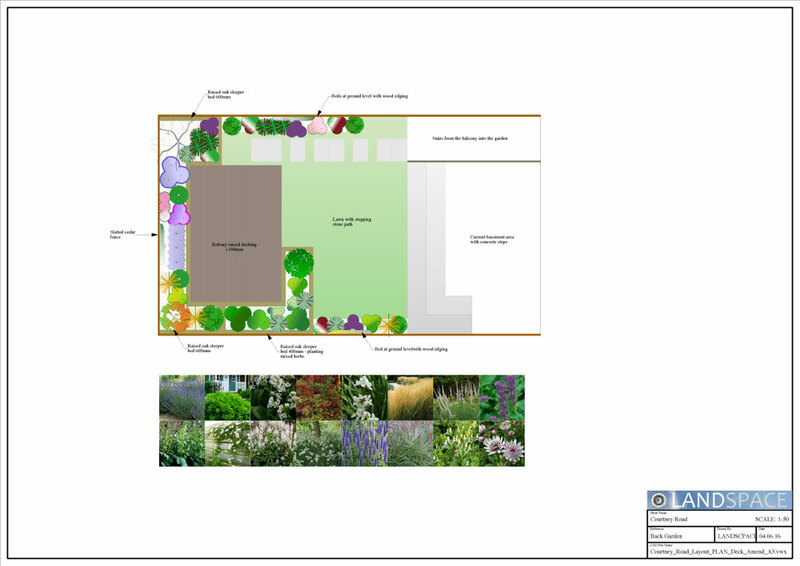 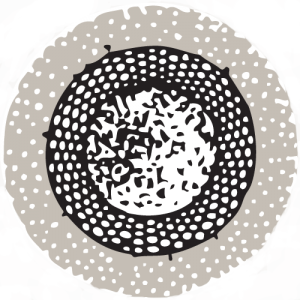 To learn more about this small urban landscape design project click here.